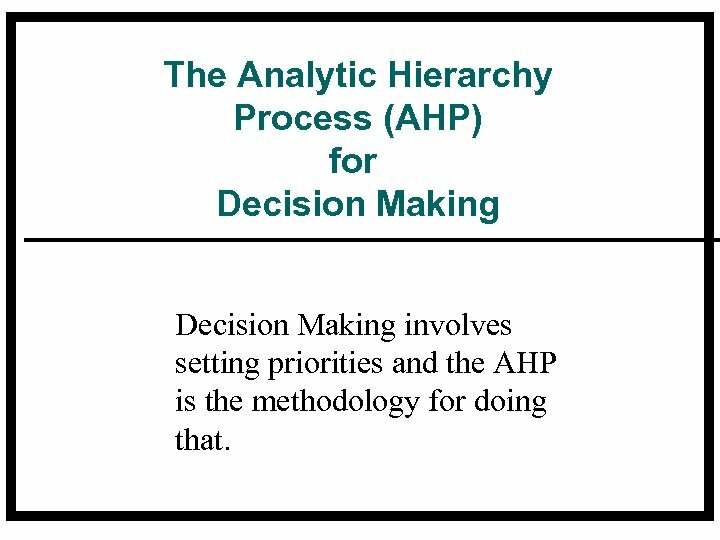 The Analytic Hierarchy Process (AHP) for Decision Making involves setting priorities and the AHP is the methodology for doing that. 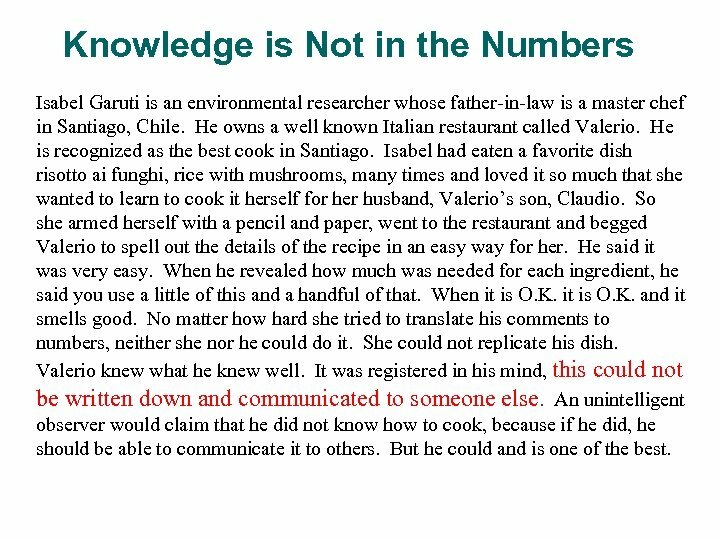 Knowledge is Not in the Numbers Isabel Garuti is an environmental researcher whose father-in-law is a master chef in Santiago, Chile. He owns a well known Italian restaurant called Valerio. He is recognized as the best cook in Santiago. Isabel had eaten a favorite dish risotto ai funghi, rice with mushrooms, many times and loved it so much that she wanted to learn to cook it herself for her husband, Valerio’s son, Claudio. So she armed herself with a pencil and paper, went to the restaurant and begged Valerio to spell out the details of the recipe in an easy way for her. He said it was very easy. When he revealed how much was needed for each ingredient, he said you use a little of this and a handful of that. When it is O. K. and it smells good. No matter how hard she tried to translate his comments to numbers, neither she nor he could do it. She could not replicate his dish. Valerio knew what he knew well. It was registered in his mind, this could not be written down and communicated to someone else. 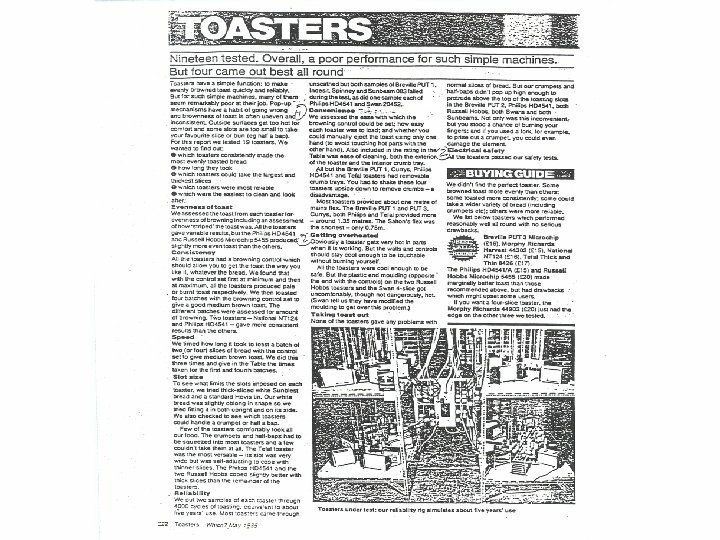 An unintelligent observer would claim that he did not know how to cook, because if he did, he should be able to communicate it to others. But he could and is one of the best. Knowing Less, Understanding More You don’t need to know everything to get to the answer. 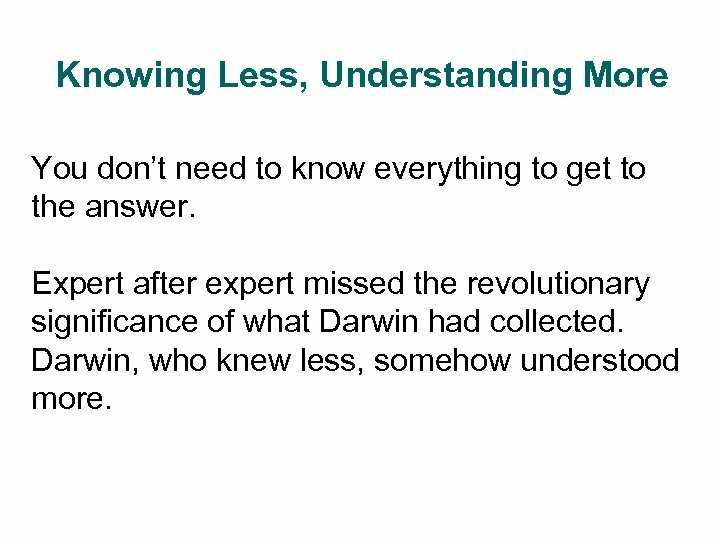 Expert after expert missed the revolutionary significance of what Darwin had collected. Darwin, who knew less, somehow understood more. Aren’t Numbers? 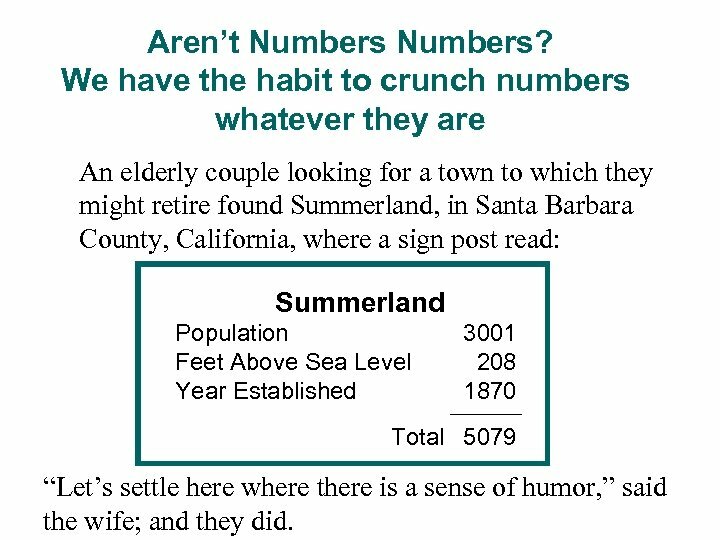 We have the habit to crunch numbers whatever they are An elderly couple looking for a town to which they might retire found Summerland, in Santa Barbara County, California, where a sign post read: Summerland Population Feet Above Sea Level Year Established 3001 208 1870 Total 5079 “Let’s settle here where there is a sense of humor, ” said the wife; and they did. Do Numbers Have an Objective Meaning? Butter: 1, 2, …, 10 lbs. 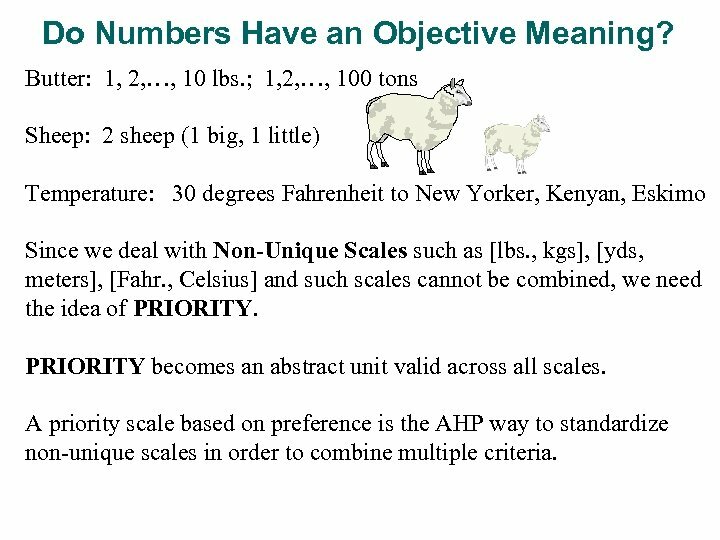 ; 1, 2, …, 100 tons Sheep: 2 sheep (1 big, 1 little) Temperature: 30 degrees Fahrenheit to New Yorker, Kenyan, Eskimo Since we deal with Non-Unique Scales such as [lbs. , kgs], [yds, meters], [Fahr. 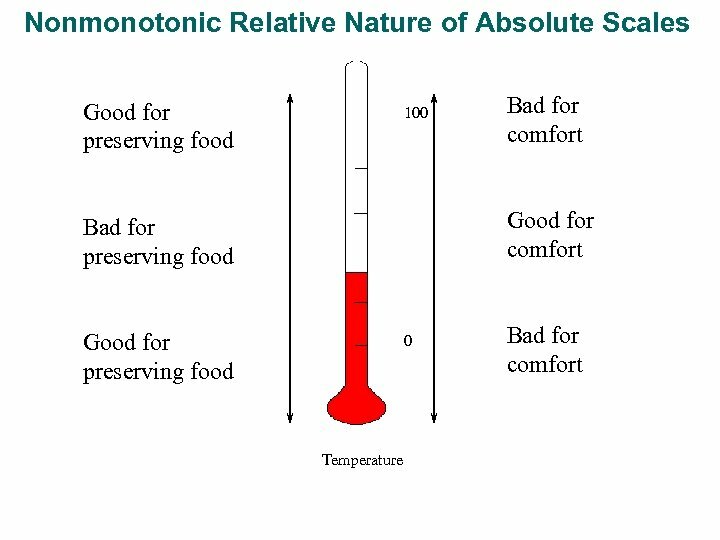 , Celsius] and such scales cannot be combined, we need the idea of PRIORITY becomes an abstract unit valid across all scales. A priority scale based on preference is the AHP way to standardize non-unique scales in order to combine multiple criteria. 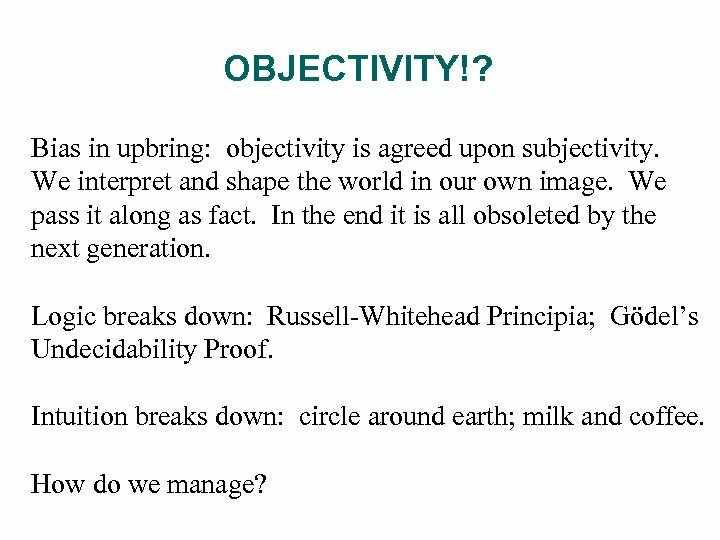 OBJECTIVITY!? Bias in upbring: objectivity is agreed upon subjectivity. We interpret and shape the world in our own image. We pass it along as fact. In the end it is all obsoleted by the next generation. Logic breaks down: Russell-Whitehead Principia; Gödel’s Undecidability Proof. Intuition breaks down: circle around earth; milk and coffee. How do we manage? 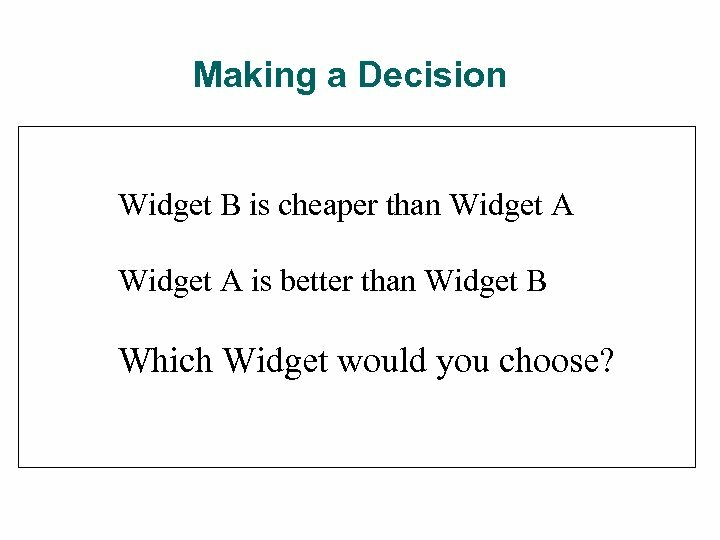 Making a Decision Widget B is cheaper than Widget A is better than Widget B Which Widget would you choose? 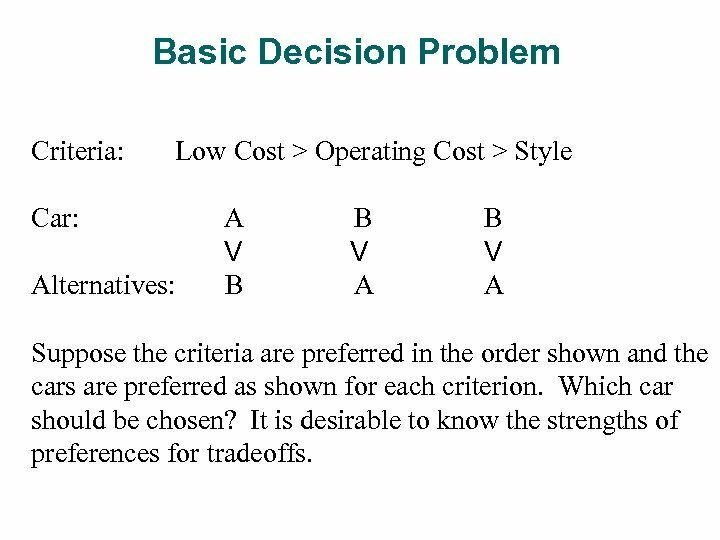 Basic Decision Problem Criteria: Low Cost > Operating Cost > Style Car: Alternatives: A V B B V A Suppose the criteria are preferred in the order shown and the cars are preferred as shown for each criterion. Which car should be chosen? 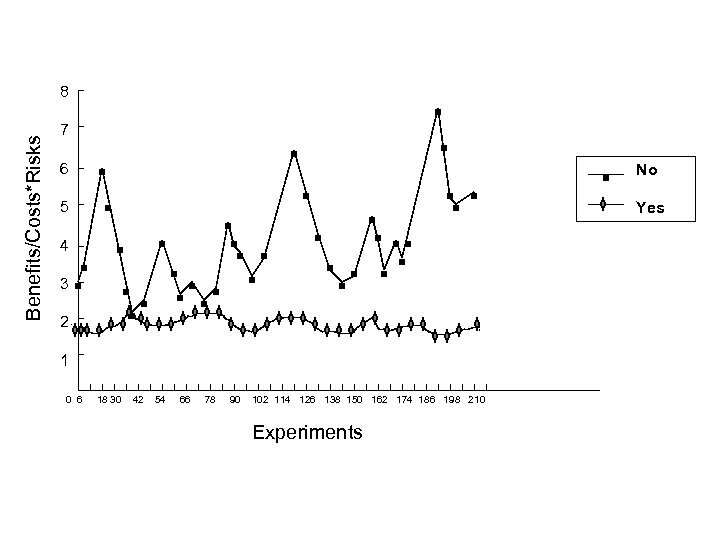 It is desirable to know the strengths of preferences for tradeoffs. 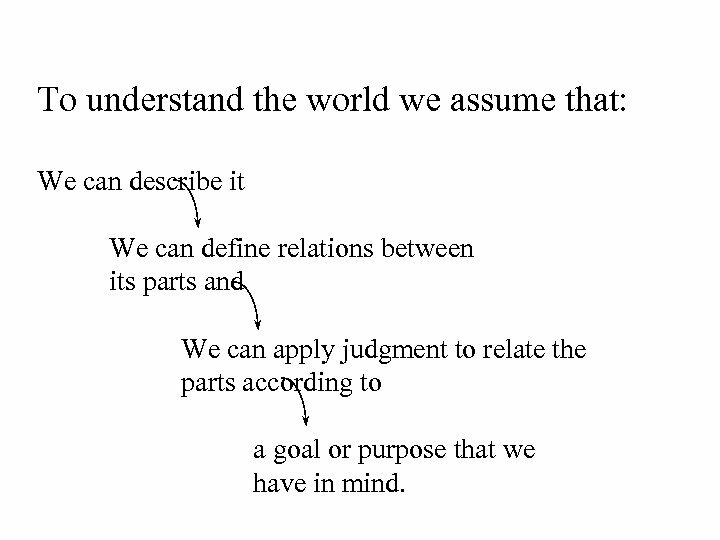 To understand the world we assume that: We can describe it We can define relations between its parts and We can apply judgment to relate the parts according to a goal or purpose that we have in mind. 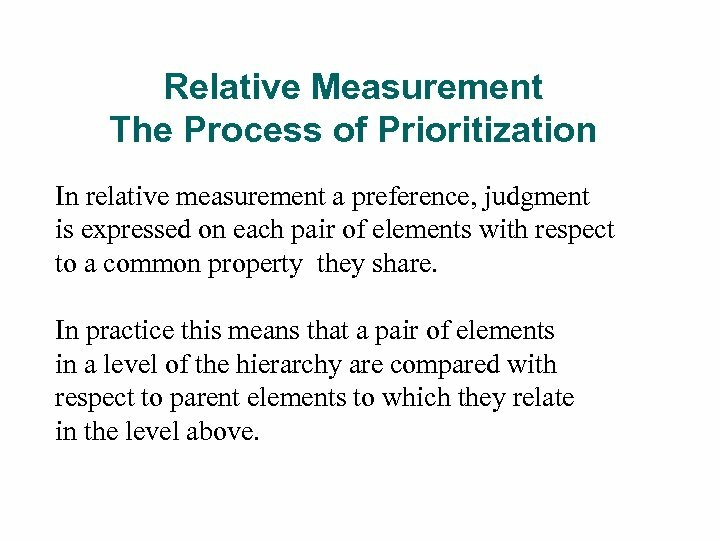 Relative Measurement The Process of Prioritization In relative measurement a preference, judgment is expressed on each pair of elements with respect to a common property they share. 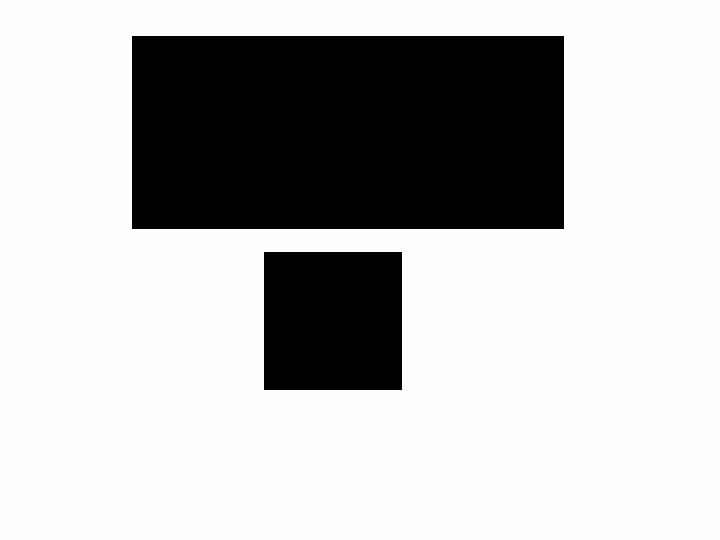 In practice this means that a pair of elements in a level of the hierarchy are compared with respect to parent elements to which they relate in the level above. 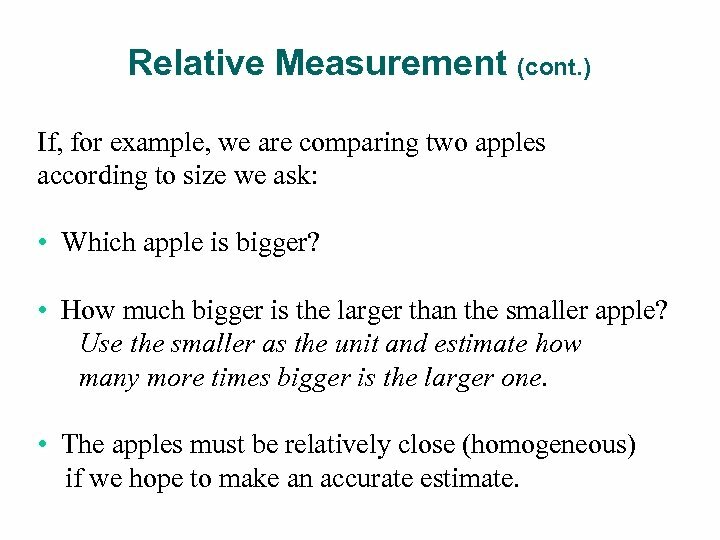 Relative Measurement (cont. ) 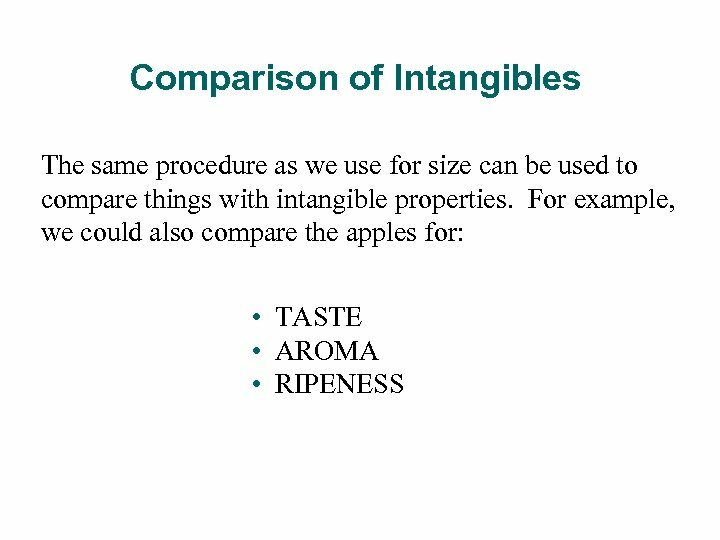 If, for example, we are comparing two apples according to size we ask: • Which apple is bigger? • How much bigger is the larger than the smaller apple? 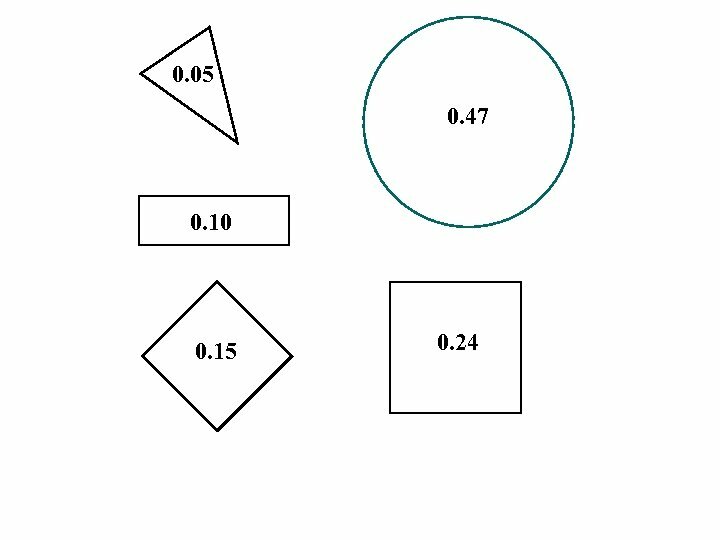 Use the smaller as the unit and estimate how many more times bigger is the larger one. 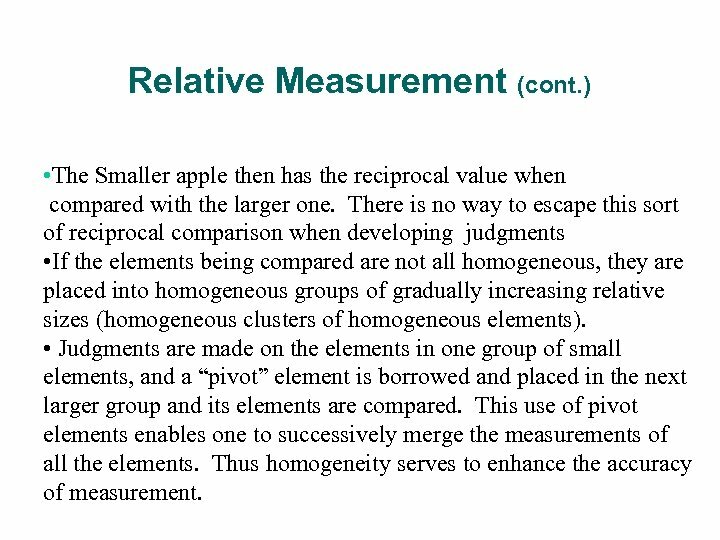 • The apples must be relatively close (homogeneous) if we hope to make an accurate estimate. Relative Measurement (cont. ) • The Smaller apple then has the reciprocal value when compared with the larger one. 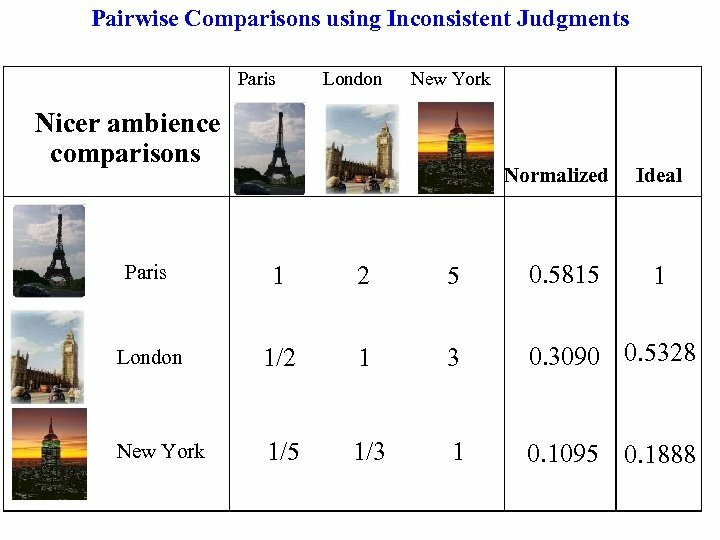 There is no way to escape this sort of reciprocal comparison when developing judgments • If the elements being compared are not all homogeneous, they are placed into homogeneous groups of gradually increasing relative sizes (homogeneous clusters of homogeneous elements). 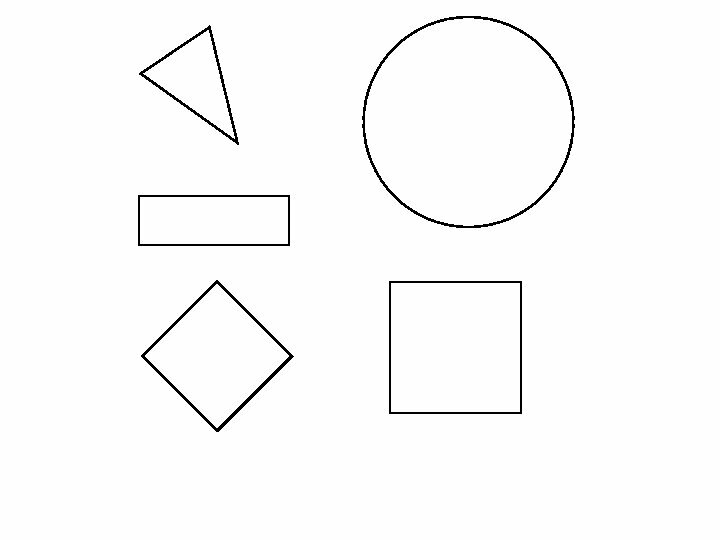 • Judgments are made on the elements in one group of small elements, and a “pivot” element is borrowed and placed in the next larger group and its elements are compared. This use of pivot elements enables one to successively merge the measurements of all the elements. Thus homogeneity serves to enhance the accuracy of measurement. 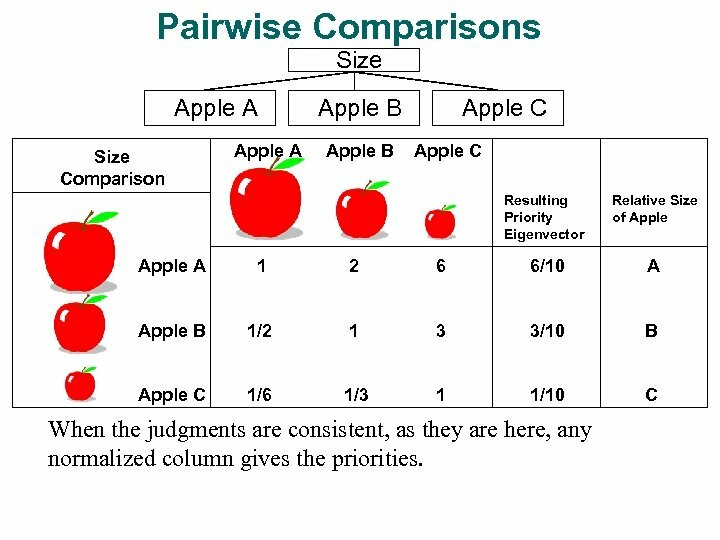 Pairwise Comparisons Size Apple A Size Comparison Apple A Apple B Apple C Resulting Priority Eigenvector Relative Size of Apple A 1 2 6 6/10 A Apple B 1/2 1 3 3/10 B Apple C 1/6 1/3 1 1/10 C When the judgments are consistent, as they are here, any normalized column gives the priorities. Consistency (cont. ) • Consistency itself is a necessary condition for a better understanding of relations in the world but it is not sufficient. 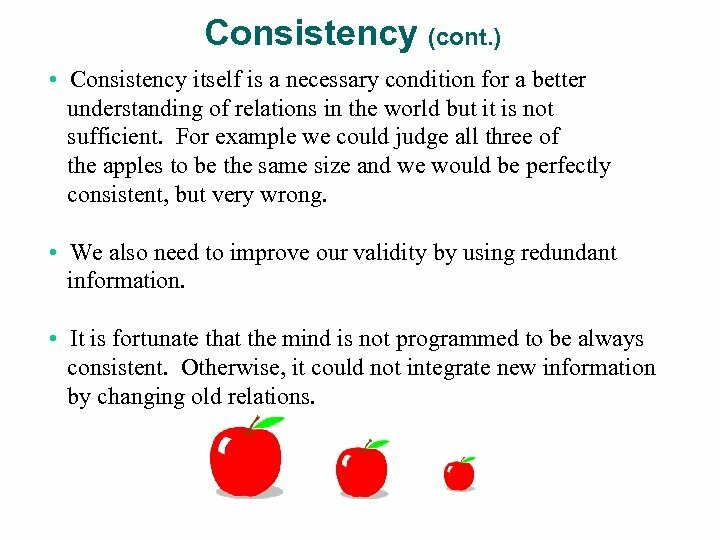 For example we could judge all three of the apples to be the same size and we would be perfectly consistent, but very wrong. • We also need to improve our validity by using redundant information. • It is fortunate that the mind is not programmed to be always consistent. Otherwise, it could not integrate new information by changing old relations. 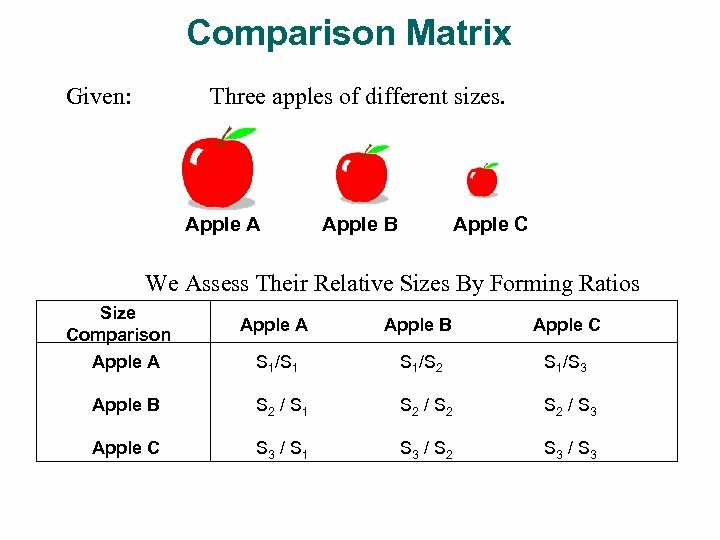 Consistency In this example Apple B is 3 times larger than Apple C. We can obtain this value directly from the comparisons of Apple A with Apples B & C as 6/2 = 3. But if we were to use judgment we may have guessed it as 4. In that case we would have been inconsistent. Now guessing it as 4 is not as bad as guessing it as 5 or more. The farther we are from the true value the more inconsistent we are. 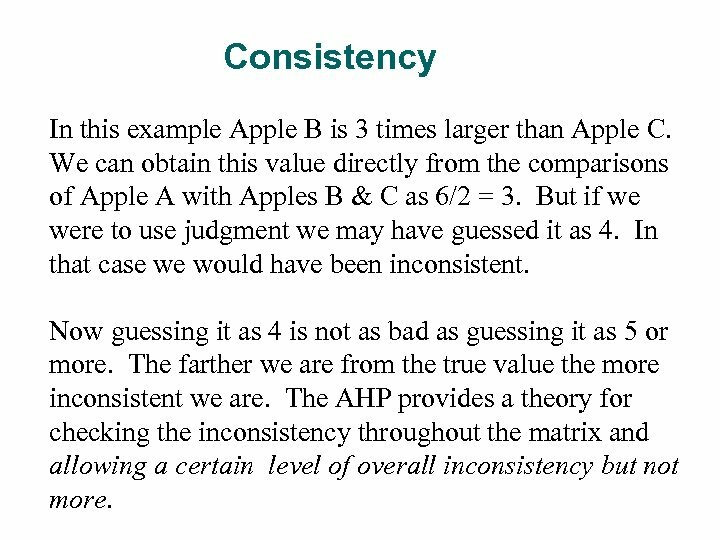 The AHP provides a theory for checking the inconsistency throughout the matrix and allowing a certain level of overall inconsistency but not more. Consistency (cont. ) Because the world of experience is vast and we deal with it in pieces according to whatever goals concern us at the time, our judgments can never be perfectly precise. 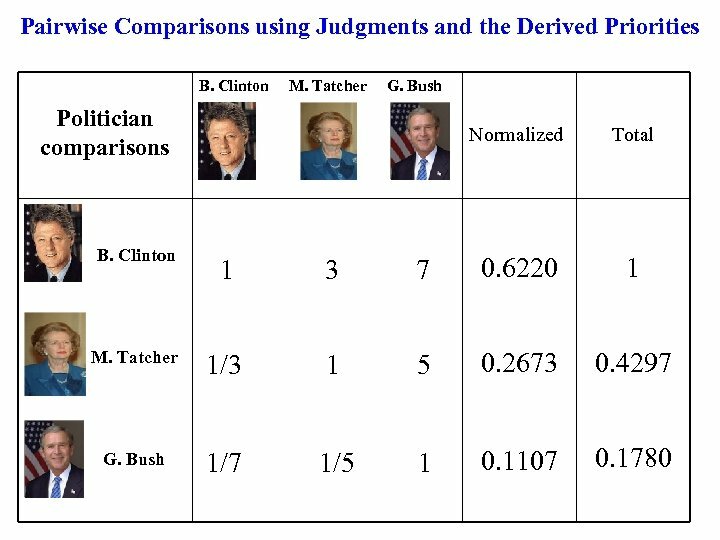 It may be impossible to make a consistent set of judgments on some pieces that make them fit exactly with another consistent set of judgments on other related pieces. So we may neither be able to be perfectly consistent nor want to be. We must allow for a modicum of inconsistency. Consistency (cont. ) 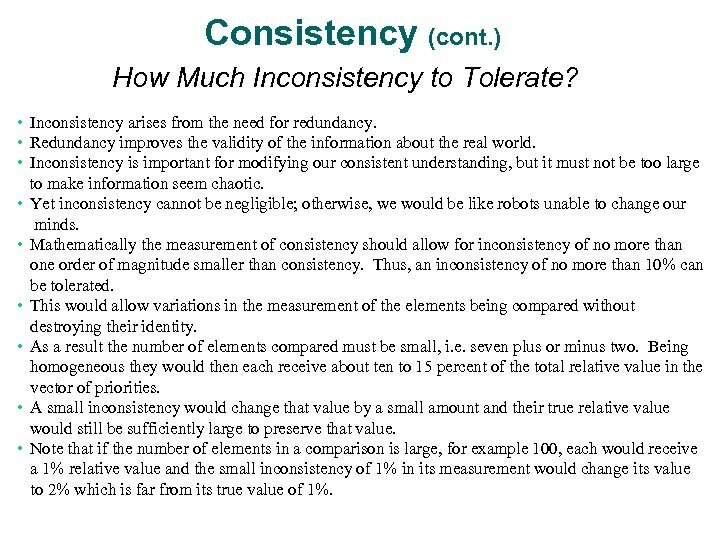 How Much Inconsistency to Tolerate? • Inconsistency arises from the need for redundancy. • Redundancy improves the validity of the information about the real world. • Inconsistency is important for modifying our consistent understanding, but it must not be too large to make information seem chaotic. • Yet inconsistency cannot be negligible; otherwise, we would be like robots unable to change our minds. • Mathematically the measurement of consistency should allow for inconsistency of no more than one order of magnitude smaller than consistency. Thus, an inconsistency of no more than 10% can be tolerated. • This would allow variations in the measurement of the elements being compared without destroying their identity. • As a result the number of elements compared must be small, i. e. seven plus or minus two. 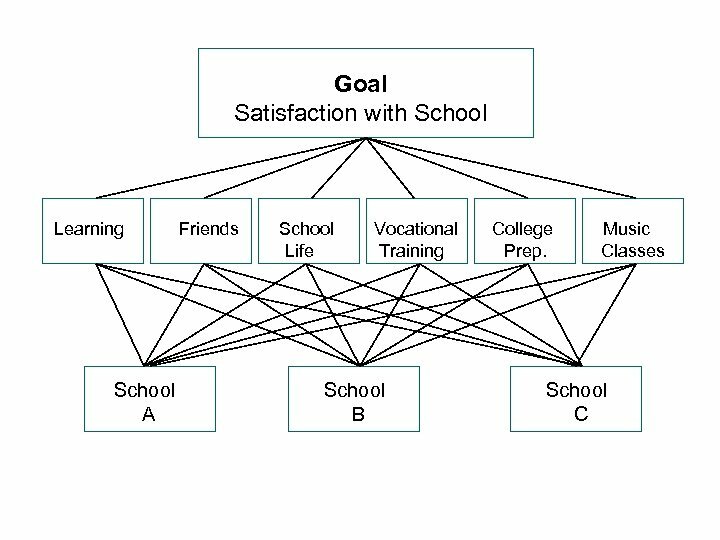 Being homogeneous they would then each receive about ten to 15 percent of the total relative value in the vector of priorities. 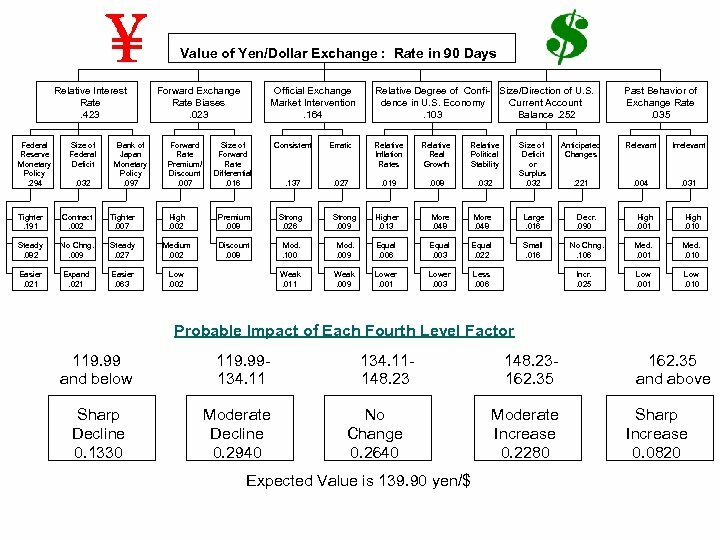 • A small inconsistency would change that value by a small amount and their true relative value would still be sufficiently large to preserve that value. 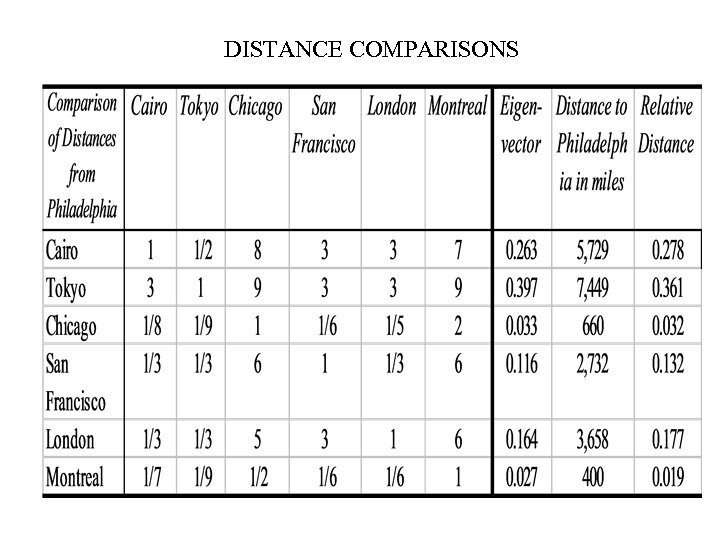 • Note that if the number of elements in a comparison is large, for example 100, each would receive a 1% relative value and the small inconsistency of 1% in its measurement would change its value to 2% which is far from its true value of 1%. 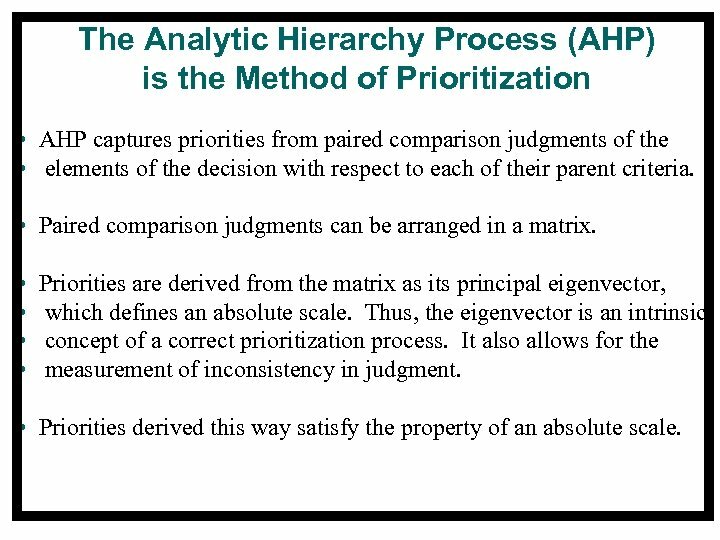 The Analytic Hierarchy Process (AHP) is the Method of Prioritization • AHP captures priorities from paired comparison judgments of the • elements of the decision with respect to each of their parent criteria. 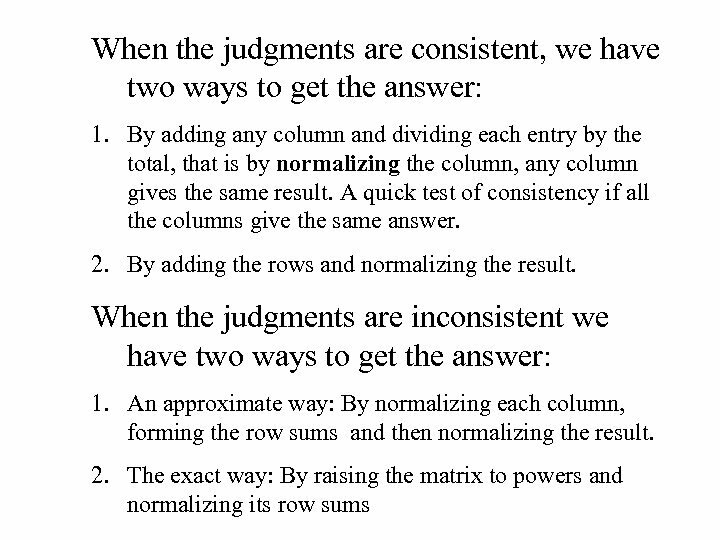 • Paired comparison judgments can be arranged in a matrix. • • Priorities are derived from the matrix as its principal eigenvector, which defines an absolute scale. 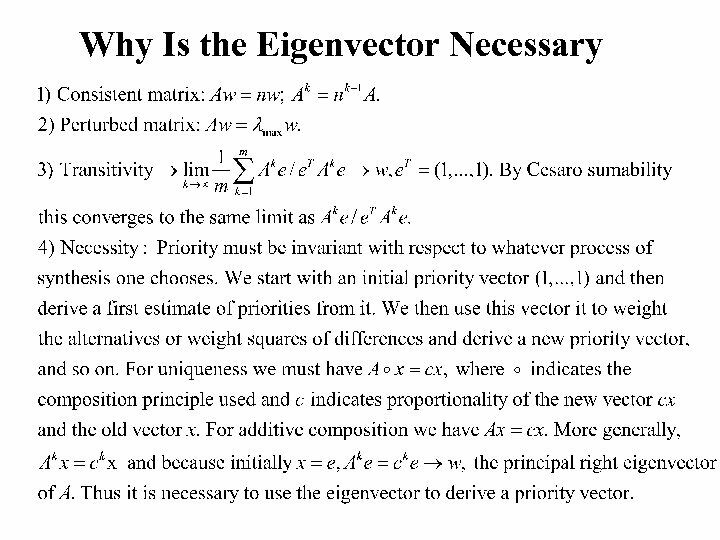 Thus, the eigenvector is an intrinsic concept of a correct prioritization process. It also allows for the measurement of inconsistency in judgment. • Priorities derived this way satisfy the property of an absolute scale. Decision Making We need to prioritize both tangible and intangible criteria: ¨ In most decisions, intangibles such as • political factors and • social factors take precedence over tangibles such as • economic factors and • technical factors ¨ It is not the precision of measurement on a particular factor that determines the validity of a decision, but the importance we attach to the factors involved. 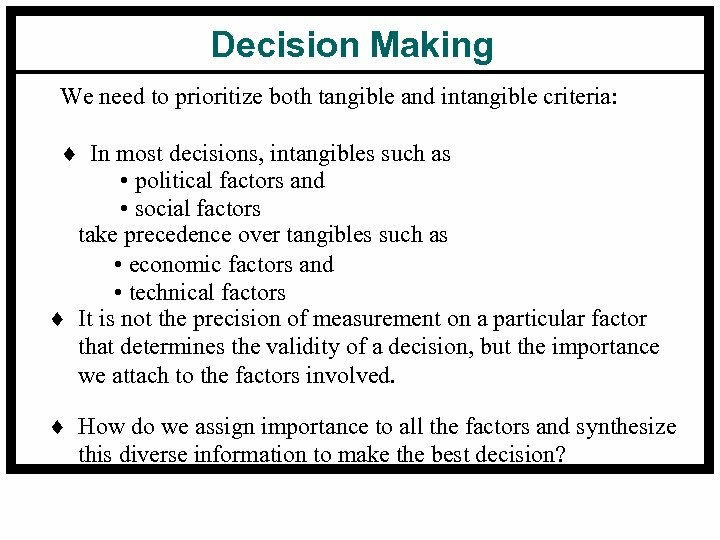 ¨ How do we assign importance to all the factors and synthesize this diverse information to make the best decision? 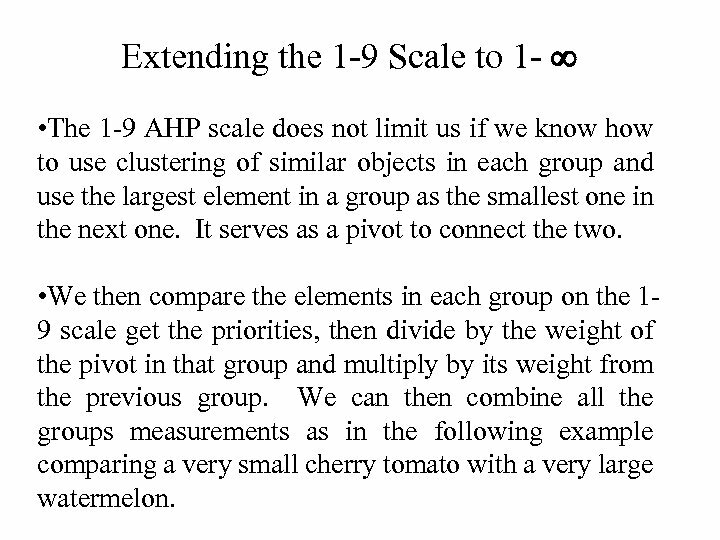 Extending the 1 -9 Scale to 1 - • The 1 -9 AHP scale does not limit us if we know how to use clustering of similar objects in each group and use the largest element in a group as the smallest one in the next one. It serves as a pivot to connect the two. 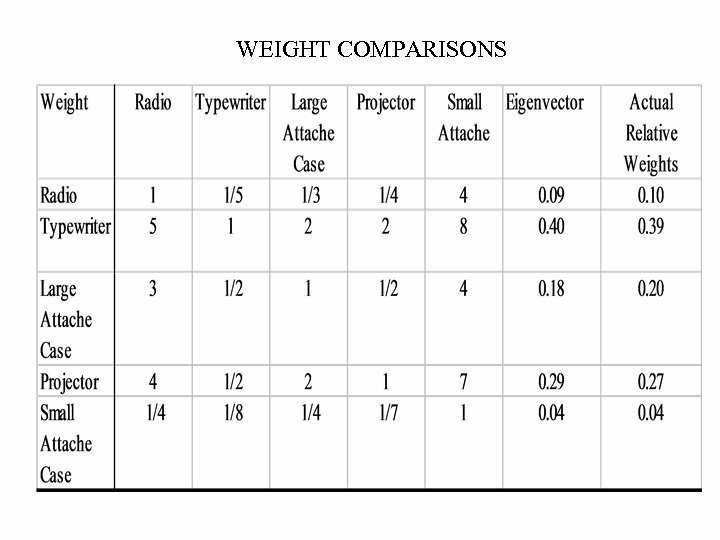 • We then compare the elements in each group on the 19 scale get the priorities, then divide by the weight of the pivot in that group and multiply by its weight from the previous group. 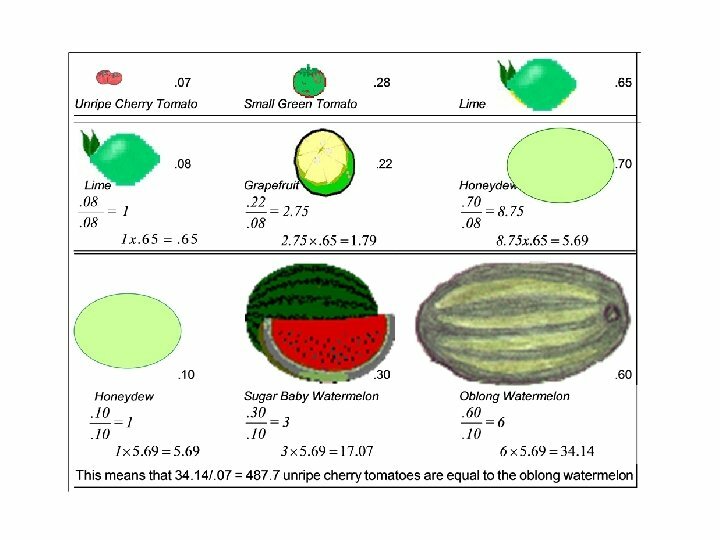 We can then combine all the groups measurements as in the following example comparing a very small cherry tomato with a very large watermelon. 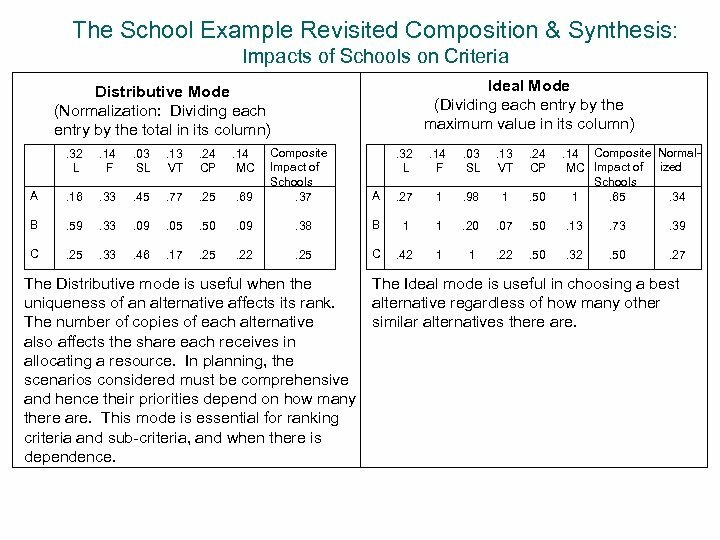 The School Example Revisited Composition & Synthesis: Impacts of Schools on Criteria Ideal Mode (Dividing each entry by the maximum value in its column) Distributive Mode (Normalization: Dividing each entry by the total in its column). 32 L . 14 F . 03 SL . 13 VT . 24 CP . 14 MC A . 16 . 33 . 45 . 77 . 25 . 69 B . 59 . 33 . 09 . 05 . 50 . 09 C . 25 . 33 . 46 . 17 . 25 . 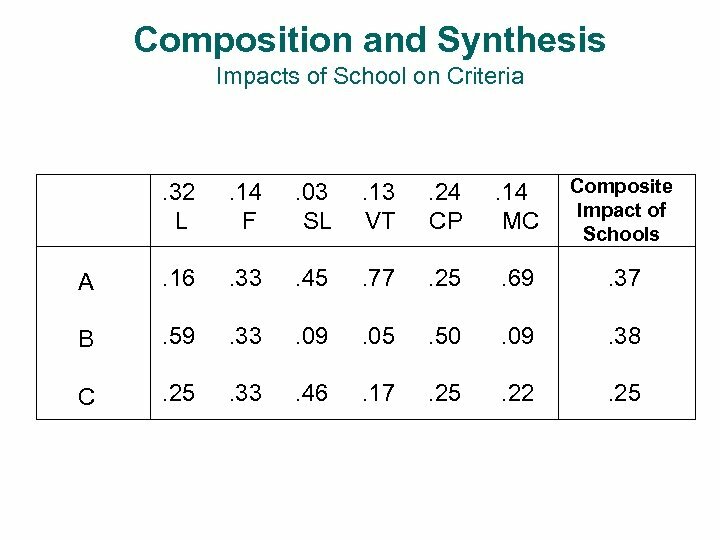 22 Composite Impact of Schools. 37 . 32 L . 14 F . 03 SL . 13 VT . 24 CP A . 27 1 . 98 1 . 50 . 14 Composite Normal. MC Impact of ized Schools 1. 65. 34 . 38 B 1 1 . 20 . 07 . 50 . 13 . 73 . 39 . 25 C . 42 1 1 . 22 . 50 . 32 . 50 . 27 The Distributive mode is useful when the The Ideal mode is useful in choosing a best uniqueness of an alternative affects its rank. alternative regardless of how many other The number of copies of each alternative similar alternatives there are. also affects the share each receives in allocating a resource. 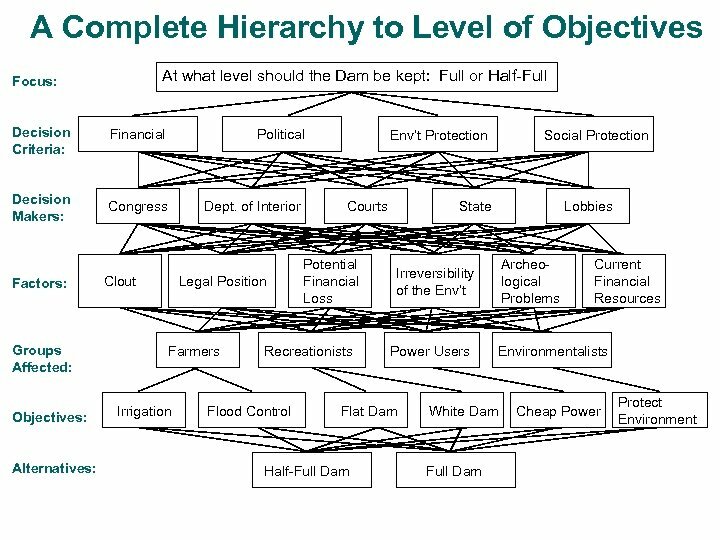 In planning, the scenarios considered must be comprehensive and hence their priorities depend on how many there are. This mode is essential for ranking criteria and sub-criteria, and when there is dependence. 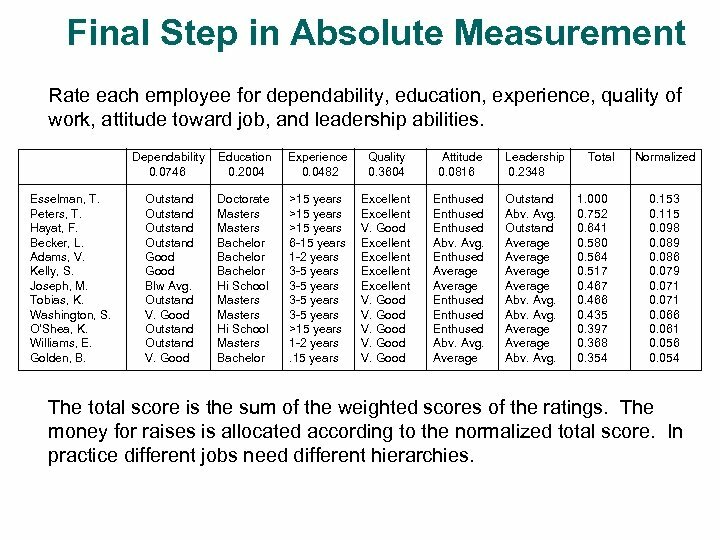 Final Step in Absolute Measurement Rate each employee for dependability, education, experience, quality of work, attitude toward job, and leadership abilities. Dependability 0. 0746 Esselman, T. Peters, T. Hayat, F. Becker, L. Adams, V. Kelly, S. Joseph, M. Tobias, K. Washington, S. O’Shea, K. Williams, E. Golden, B. Education 0. 2004 Experience 0. 0482 Quality 0. 3604 Attitude 0. 0816 Outstand Good Blw Avg. Outstand V. Good Doctorate Masters Bachelor Hi School Masters Bachelor >15 years 6 -15 years 1 -2 years 3 -5 years >15 years 1 -2 years. 15 years Excellent V. Good Excellent V. Good Enthused Abv. Avg. Enthused Average Enthused Abv. Avg. Average Leadership 0. 2348 Outstand Abv. Avg. Outstand Average Abv. Avg. Total 1. 000 0. 752 0. 641 0. 580 0. 564 0. 517 0. 466 0. 435 0. 397 0. 368 0. 354 Normalized 0. 153 0. 115 0. 098 0. 089 0. 086 0. 079 0. 071 0. 066 0. 061 0. 056 0. 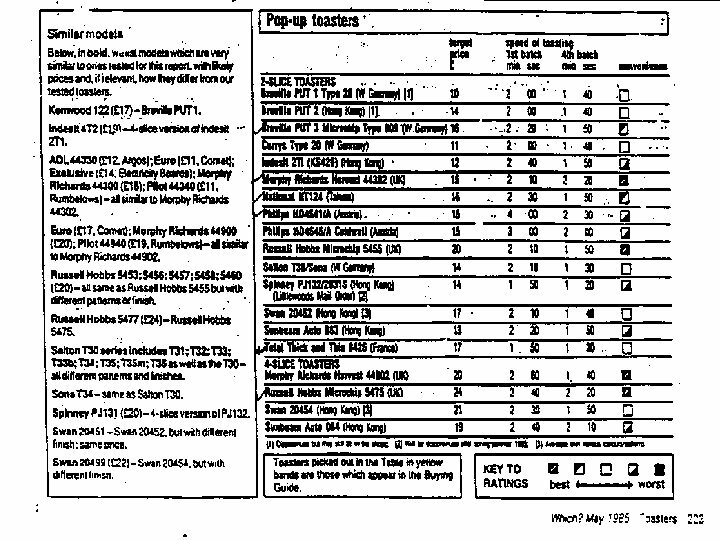 054 The total score is the sum of the weighted scores of the ratings. 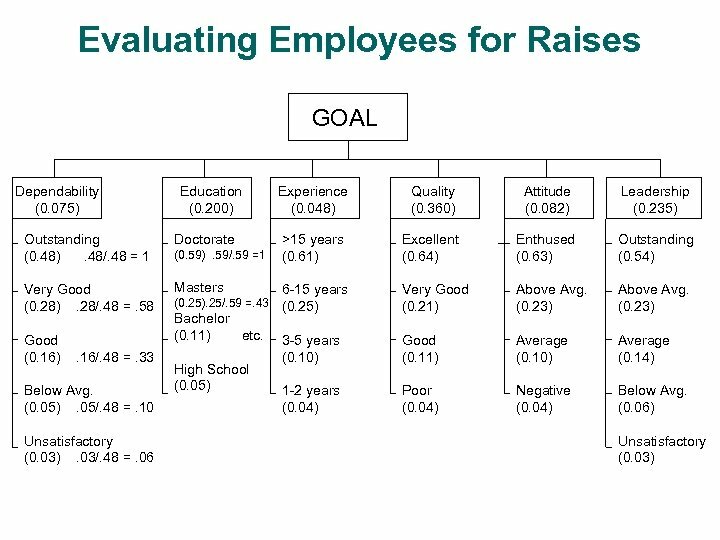 The money for raises is allocated according to the normalized total score. 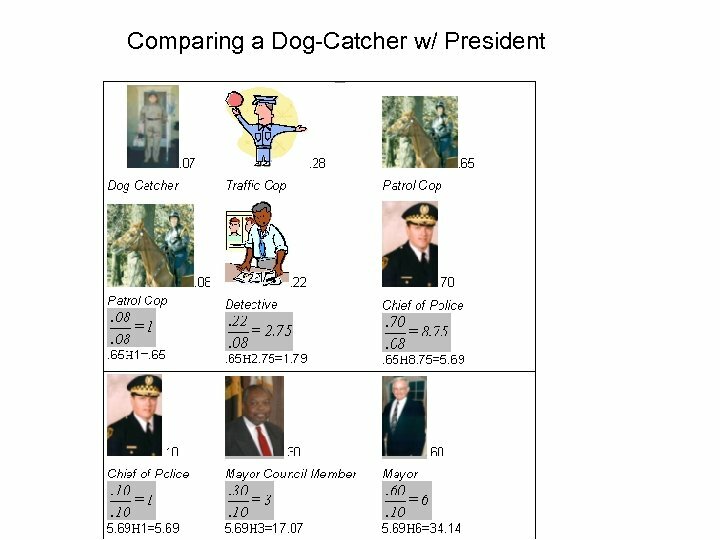 In practice different jobs need different hierarchies. 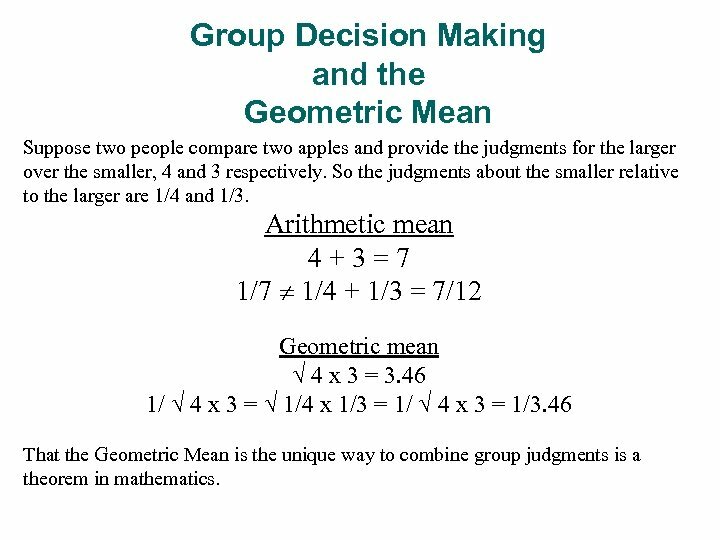 Group Decision Making and the Geometric Mean Suppose two people compare two apples and provide the judgments for the larger over the smaller, 4 and 3 respectively. 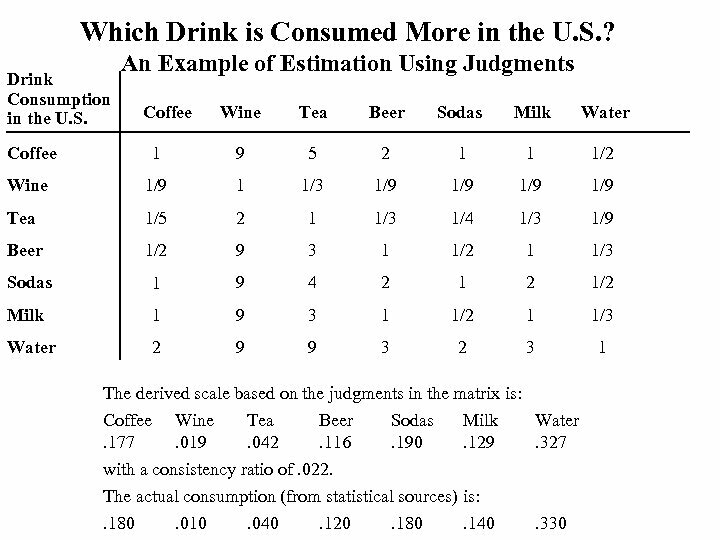 So the judgments about the smaller relative to the larger are 1/4 and 1/3. Arithmetic mean 4+3=7 1/7 1/4 + 1/3 = 7/12 Geometric mean 4 x 3 = 3. 46 1/ 4 x 3 = 1/4 x 1/3 = 1/ 4 x 3 = 1/3. 46 That the Geometric Mean is the unique way to combine group judgments is a theorem in mathematics. Let A 1, A 2, …, An, be a set of stimuli. 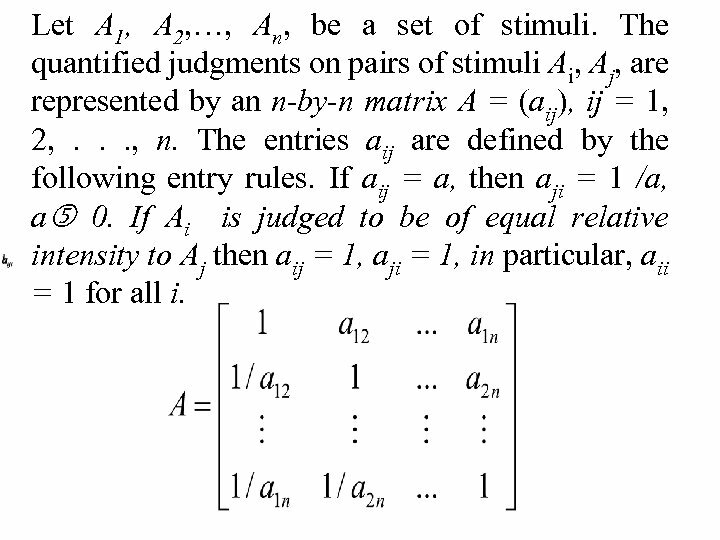 The quantified judgments on pairs of stimuli Ai, Aj, are represented by an n‑by‑n matrix A = (aij), ij = 1, 2, . . . , n. The entries aij are defined by the following entry rules. If aij = a, then aji = 1 /a, a 0. If Ai is judged to be of equal relative intensity to Aj then aij = 1, aji = 1, in particular, aii = 1 for all i. 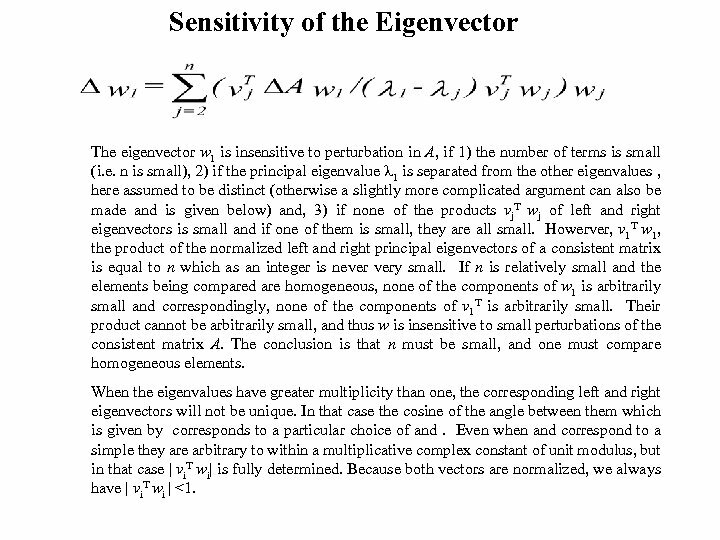 Sensitivity of the Eigenvector The eigenvector w 1 is insensitive to perturbation in A, if 1) the number of terms is small (i. e. n is small), 2) if the principal eigenvalue 1 is separated from the other eigenvalues , here assumed to be distinct (otherwise a slightly more complicated argument can also be made and is given below) and, 3) if none of the products vj. 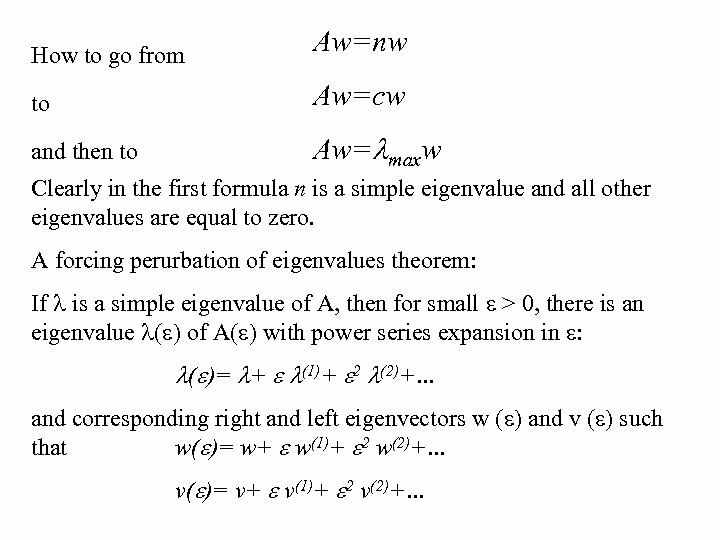 T wj of left and right eigenvectors is small and if one of them is small, they are all small. 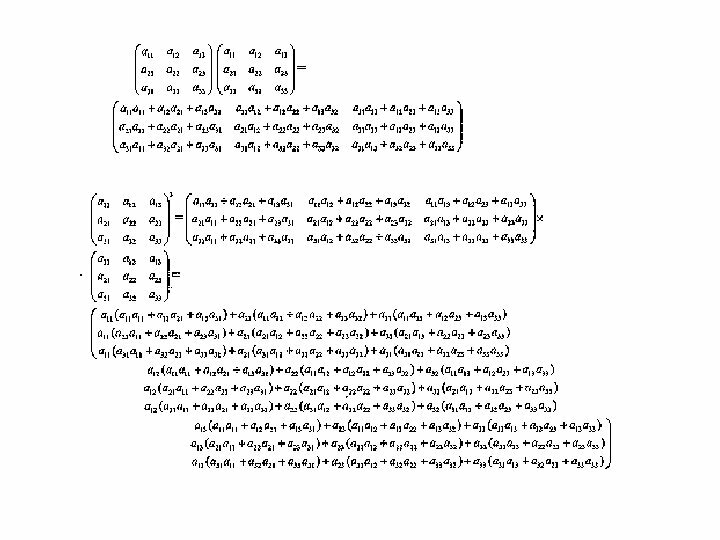 Howerver, v 1 T w 1, the product of the normalized left and right principal eigenvectors of a consistent matrix is equal to n which as an integer is never very small. 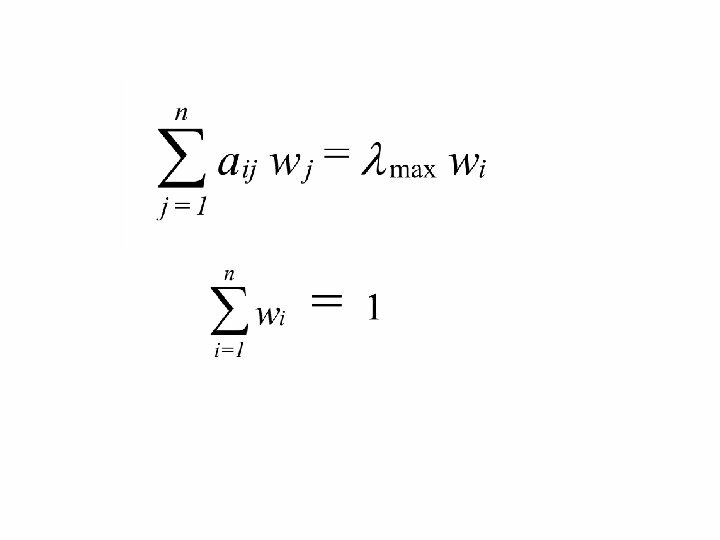 If n is relatively small and the elements being compared are homogeneous, none of the components of w 1 is arbitrarily small and correspondingly, none of the components of v 1 T is arbitrarily small. 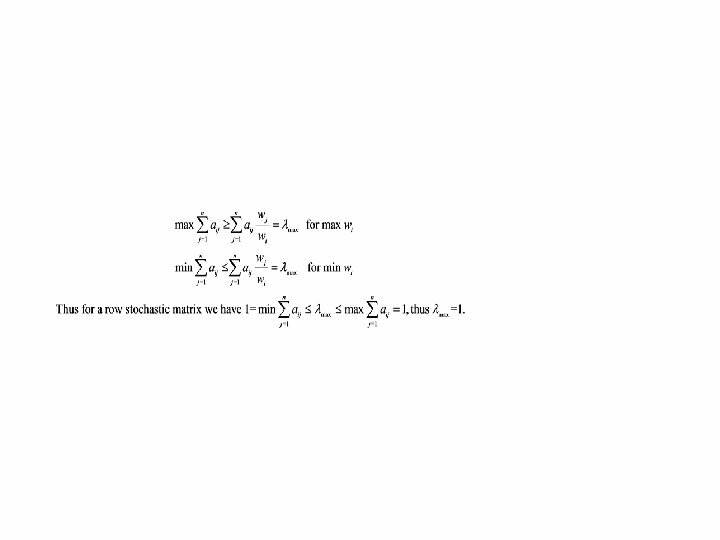 Their product cannot be arbitrarily small, and thus w is insensitive to small perturbations of the consistent matrix A. 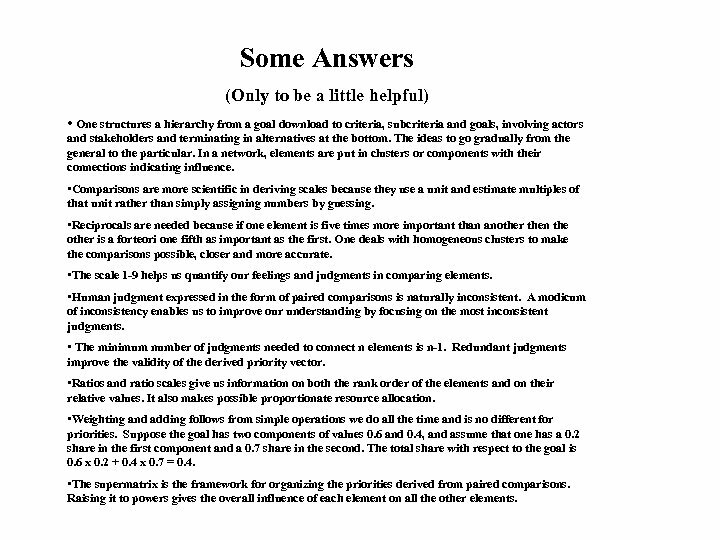 The conclusion is that n must be small, and one must compare homogeneous elements. When the eigenvalues have greater multiplicity than one, the corresponding left and right eigenvectors will not be unique. In that case the cosine of the angle between them which is given by corresponds to a particular choice of and. Even when and correspond to a simple they are arbitrary to within a multiplicative complex constant of unit modulus, but in that case | vi. T wi| is fully determined. Because both vectors are normalized, we always have | vi. T wi | <1. 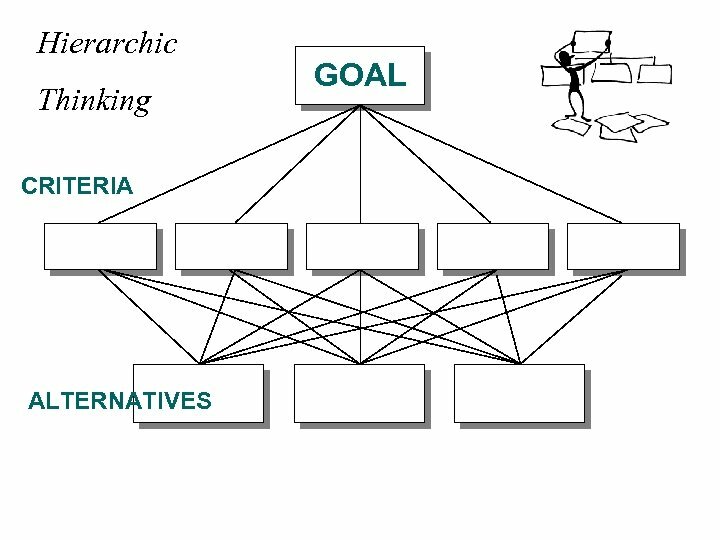 Some Answers (Only to be a little helpful) • One structures a hierarchy from a goal download to criteria, subcriteria and goals, involving actors and stakeholders and terminating in alternatives at the bottom. The ideas to go gradually from the general to the particular. In a network, elements are put in clusters or components with their connections indicating influence. 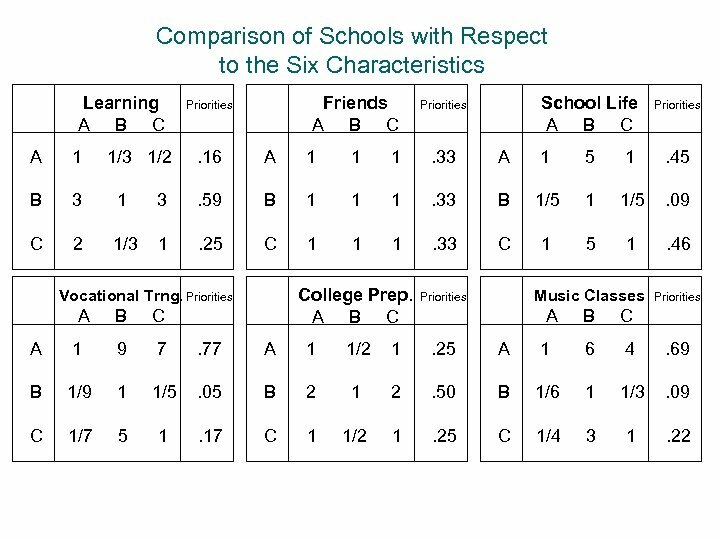 • Comparisons are more scientific in deriving scales because they use a unit and estimate multiples of that unit rather than simply assigning numbers by guessing. • Reciprocals are needed because if one element is five times more important than another then the other is a forteori one fifth as important as the first. One deals with homogeneous clusters to make the comparisons possible, closer and more accurate. 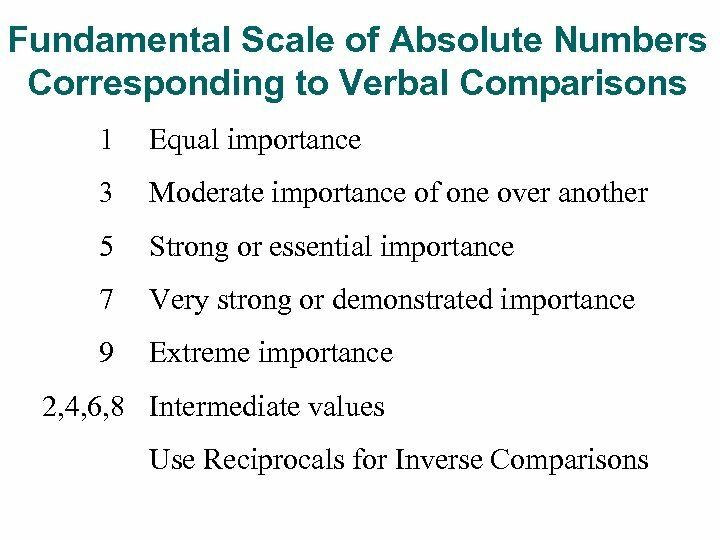 • The scale 1 -9 helps us quantify our feelings and judgments in comparing elements. 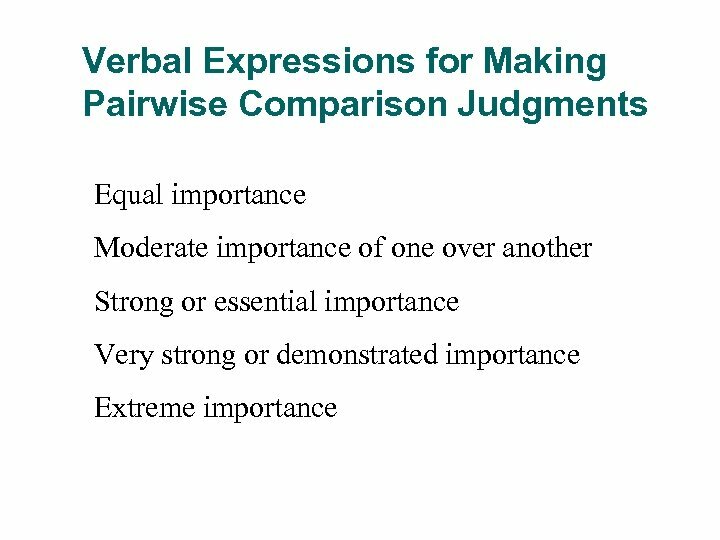 • Human judgment expressed in the form of paired comparisons is naturally inconsistent. 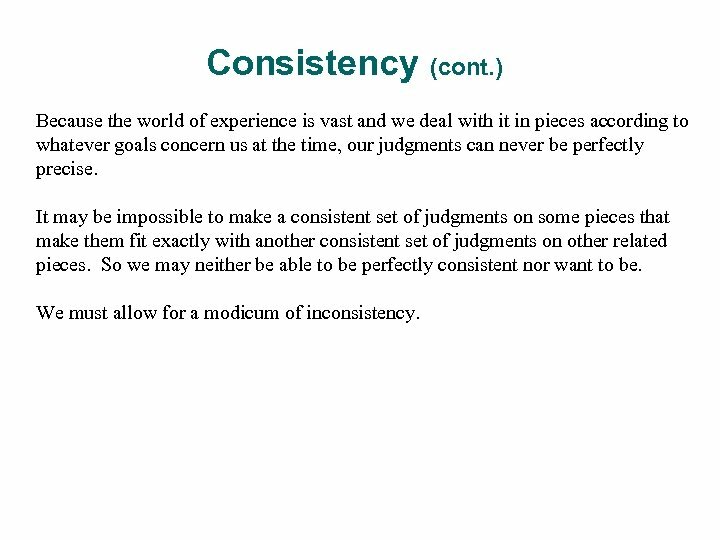 A modicum of inconsistency enables us to improve our understanding by focusing on the most inconsistent judgments. • The minimum number of judgments needed to connect n elements is n-1. 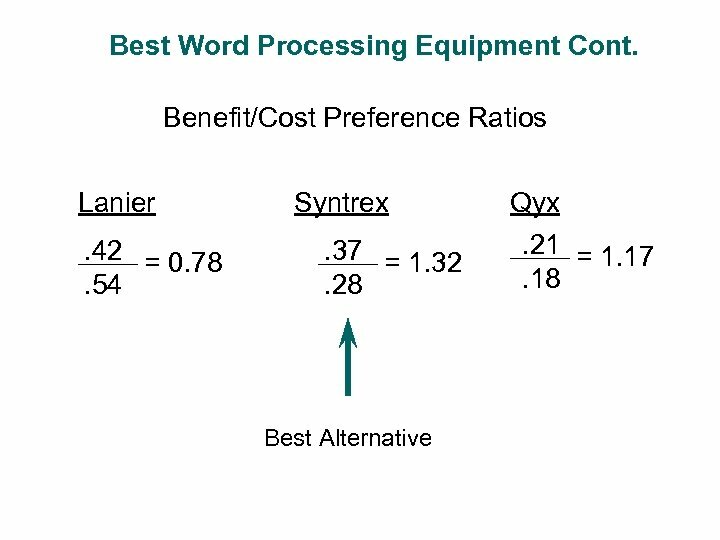 Redundant judgments improve the validity of the derived priority vector. 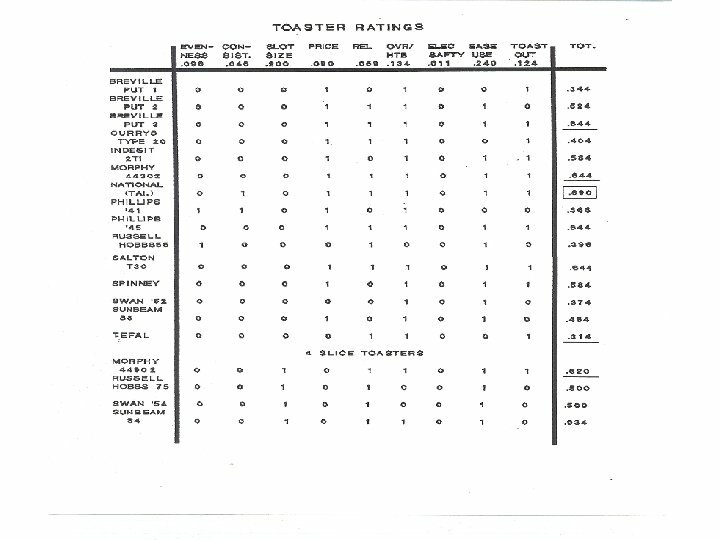 • Ratios and ratio scales give us information on both the rank order of the elements and on their relative values. It also makes possible proportionate resource allocation. • Weighting and adding follows from simple operations we do all the time and is no different for priorities. 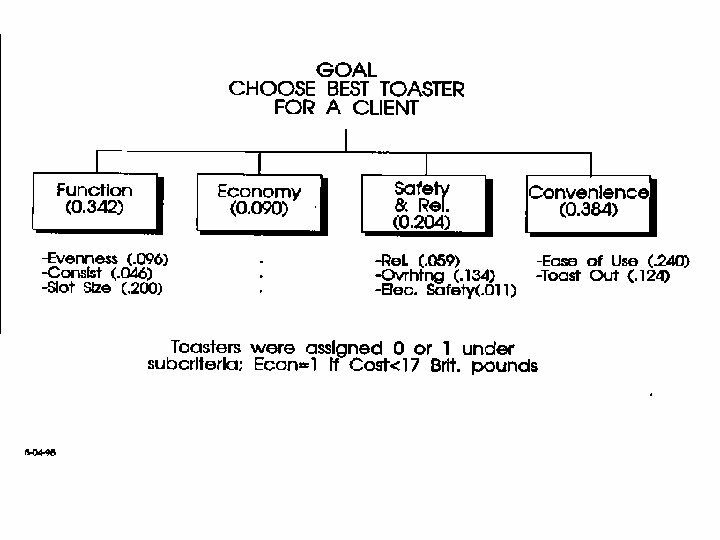 Suppose the goal has two components of values 0. 6 and 0. 4, and assume that one has a 0. 2 share in the first component and a 0. 7 share in the second. The total share with respect to the goal is 0. 6 x 0. 2 + 0. 4 x 0. 7 = 0. 4. 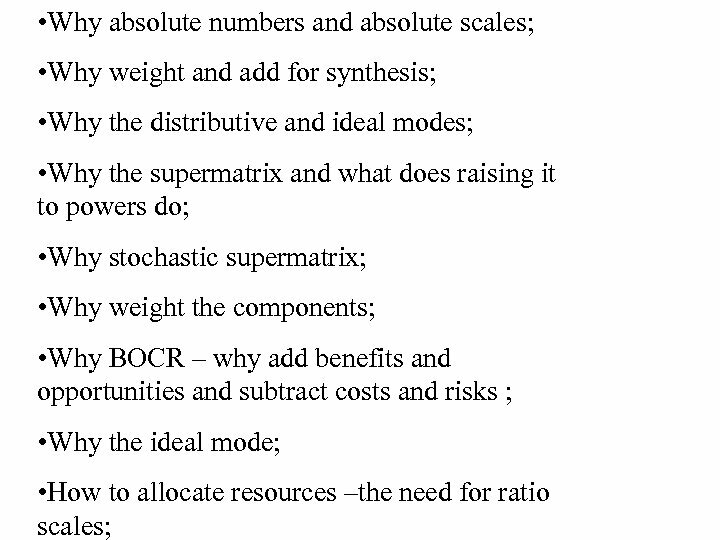 • The supermatrix is the framework for organizing the priorities derived from paired comparisons. Raising it to powers gives the overall influence of each element on all the other elements. 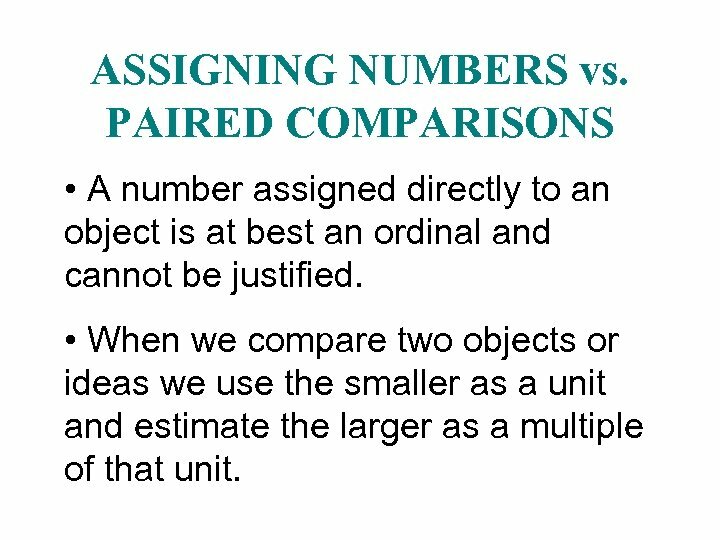 ASSIGNING NUMBERS vs. PAIRED COMPARISONS • A number assigned directly to an object is at best an ordinal and cannot be justified. 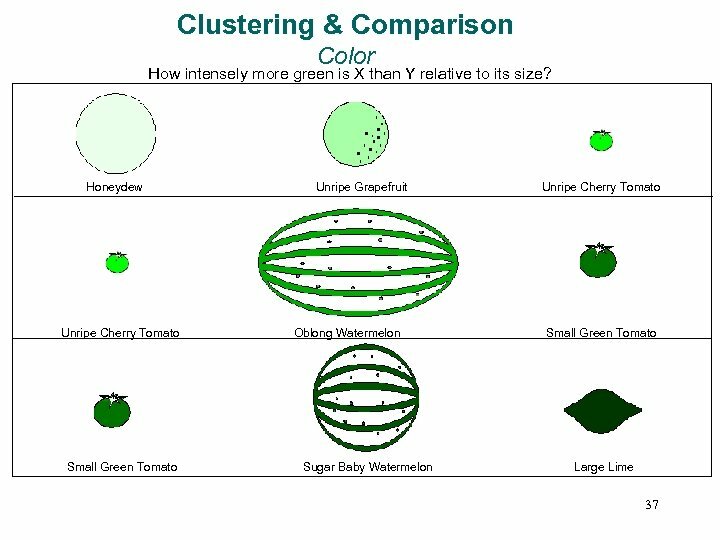 • When we compare two objects or ideas we use the smaller as a unit and estimate the larger as a multiple of that unit. 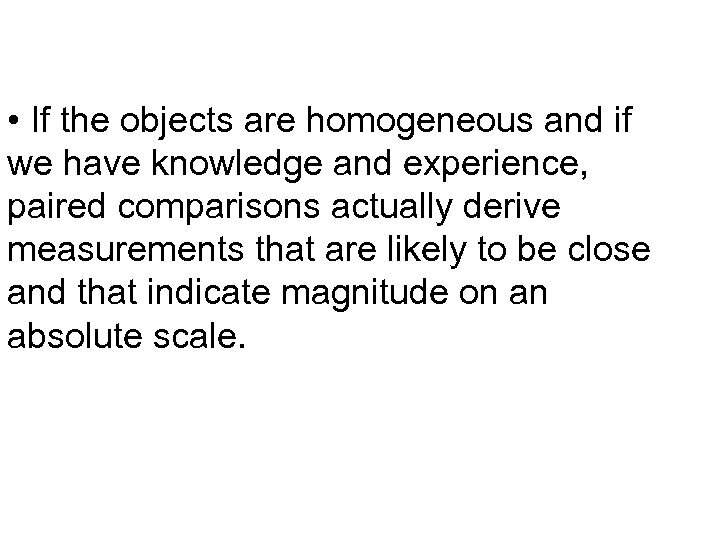 • If the objects are homogeneous and if we have knowledge and experience, paired comparisons actually derive measurements that are likely to be close and that indicate magnitude on an absolute scale. 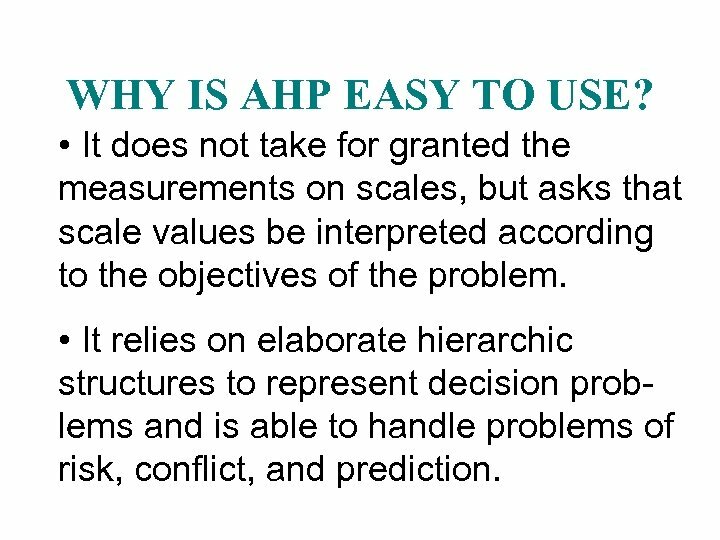 WHY IS AHP EASY TO USE? 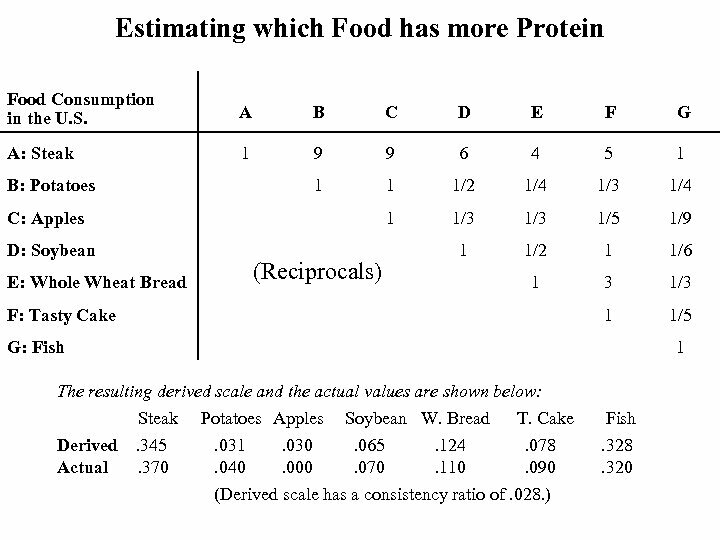 • It does not take for granted the measurements on scales, but asks that scale values be interpreted according to the objectives of the problem. 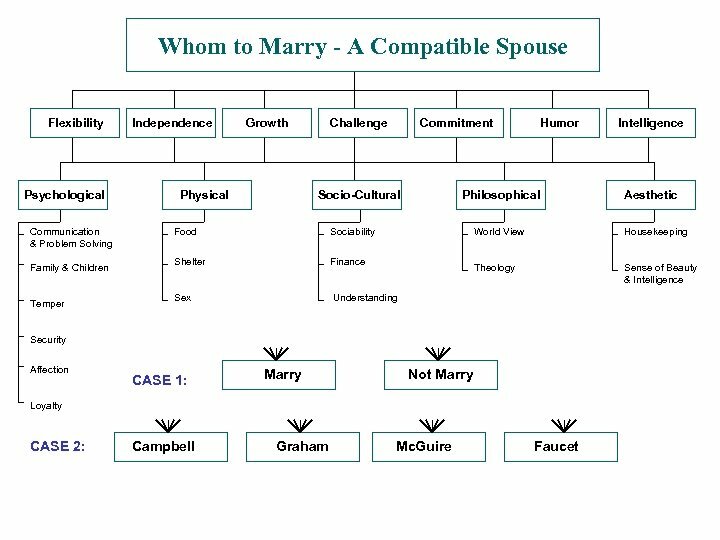 • It relies on elaborate hierarchic structures to represent decision problems and is able to handle problems of risk, conflict, and prediction. 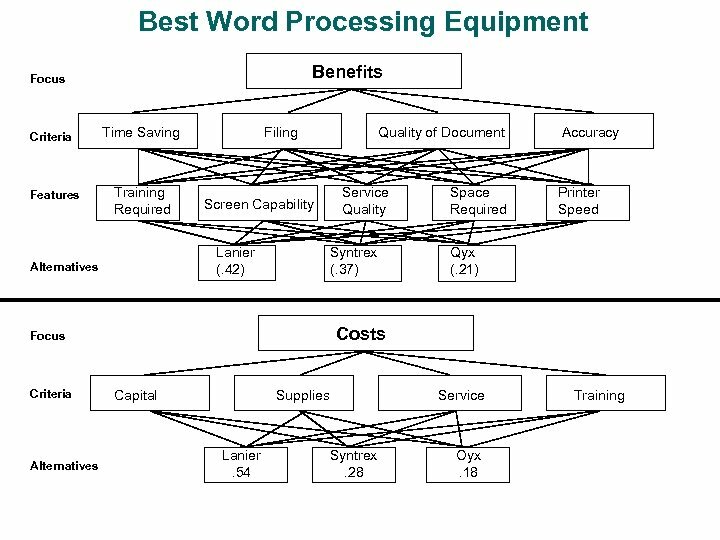 • It can be used to make direct resource allocation, benefit/cost analysis, resolve conflicts, design and optimize systems. 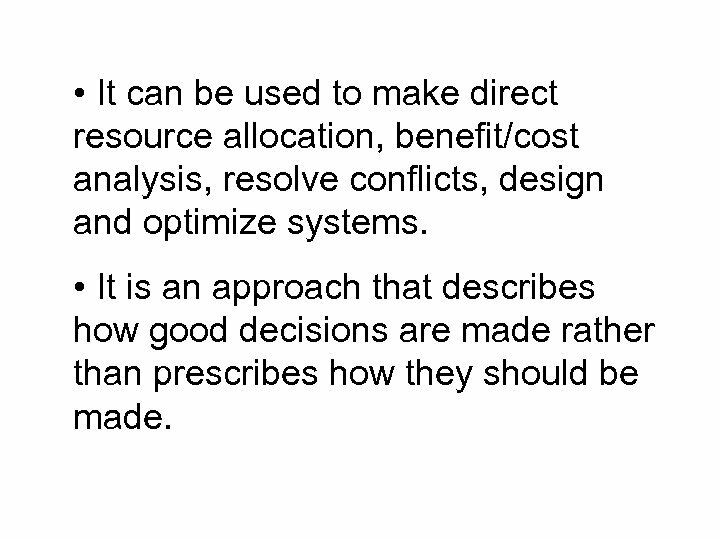 • It is an approach that describes how good decisions are made rather than prescribes how they should be made. 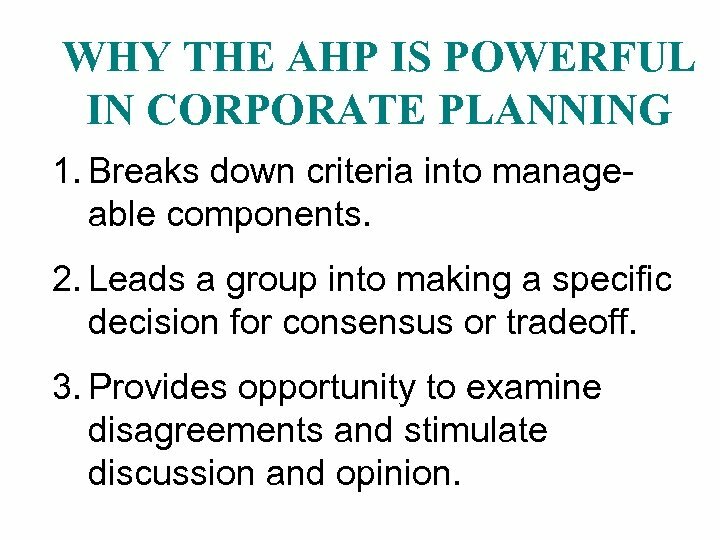 WHY THE AHP IS POWERFUL IN CORPORATE PLANNING 1. 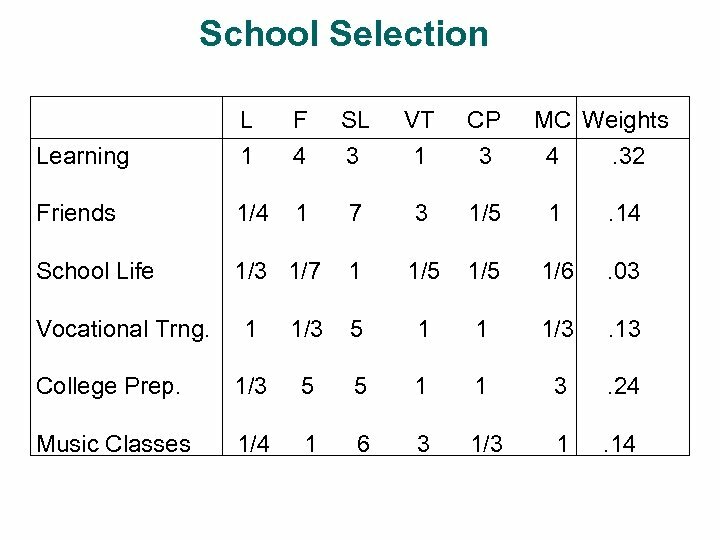 Breaks down criteria into manageable components. 2. 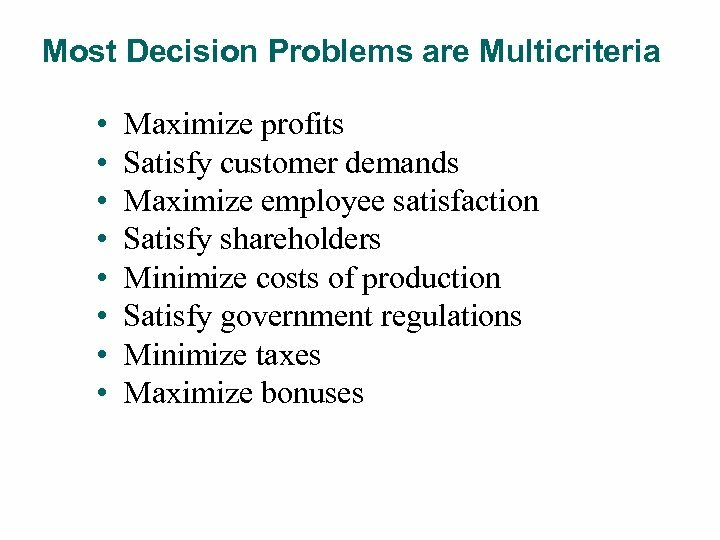 Leads a group into making a specific decision for consensus or tradeoff. 3. 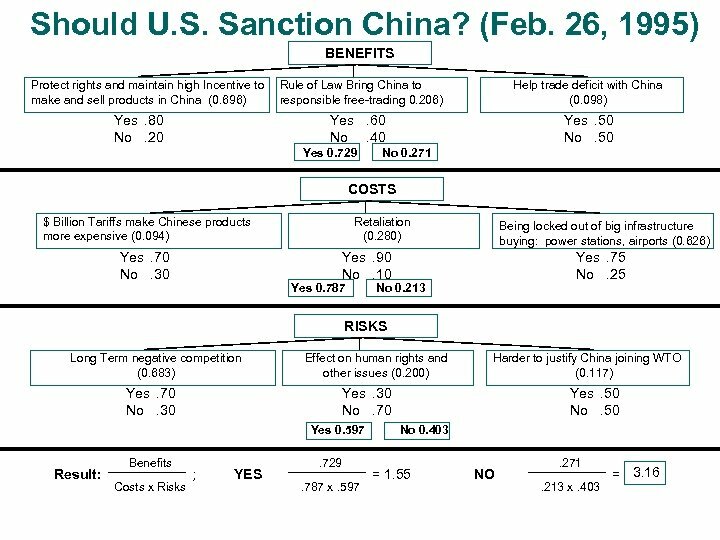 Provides opportunity to examine disagreements and stimulate discussion and opinion. 4. 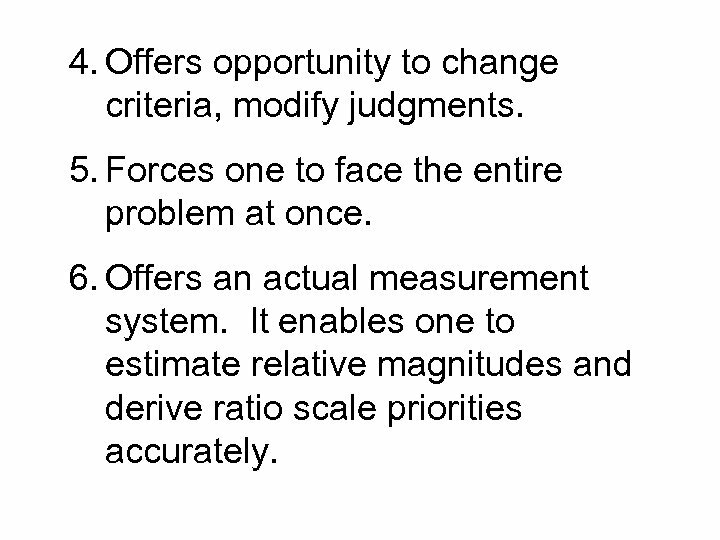 Offers opportunity to change criteria, modify judgments. 5. Forces one to face the entire problem at once. 6. 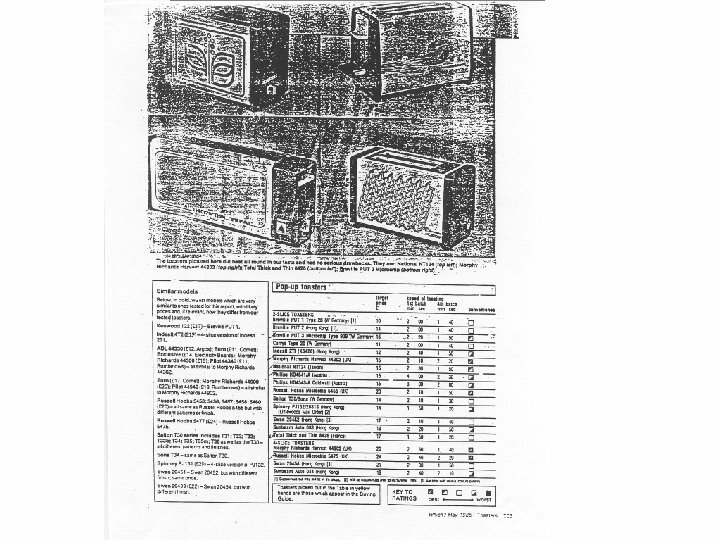 Offers an actual measurement system. It enables one to estimate relative magnitudes and derive ratio scale priorities accurately. 7. 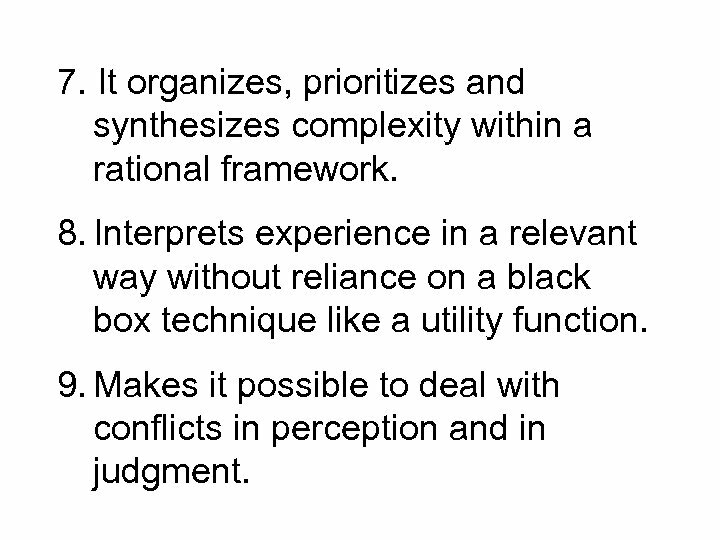 It organizes, prioritizes and synthesizes complexity within a rational framework. 8. 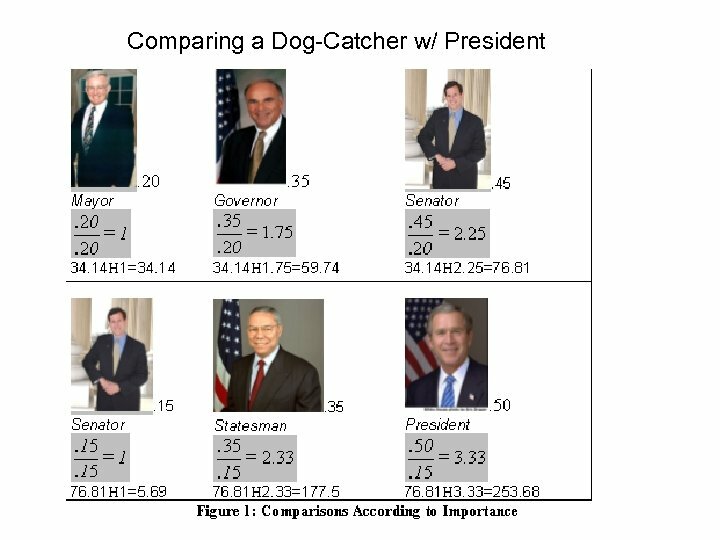 Interprets experience in a relevant way without reliance on a black box technique like a utility function. 9. 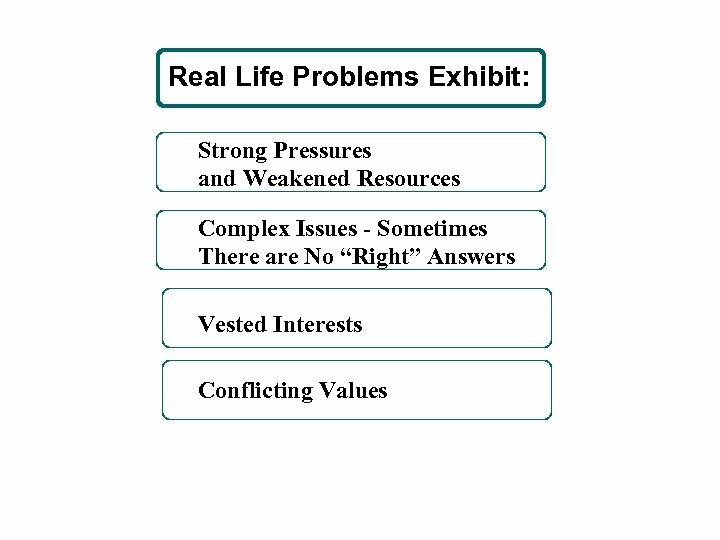 Makes it possible to deal with conflicts in perception and in judgment.